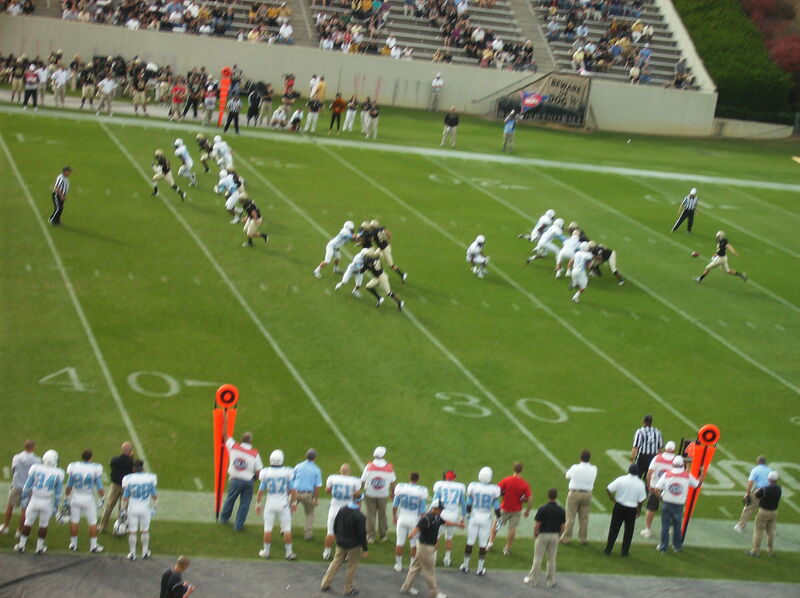 Wofford 24, The Citadel 21. I don’t really have a lot to say (or write, I suppose) about this game that hasn’t been said already. It was close, and the Dogs made a lot of good plays. They just didn’t make enough of them. It’s hard to win on the road when you spot a good team 17 points, although to be fair The Citadel did not play poorly in the first half. There were a few bad breaks, and also some missed opportunities. 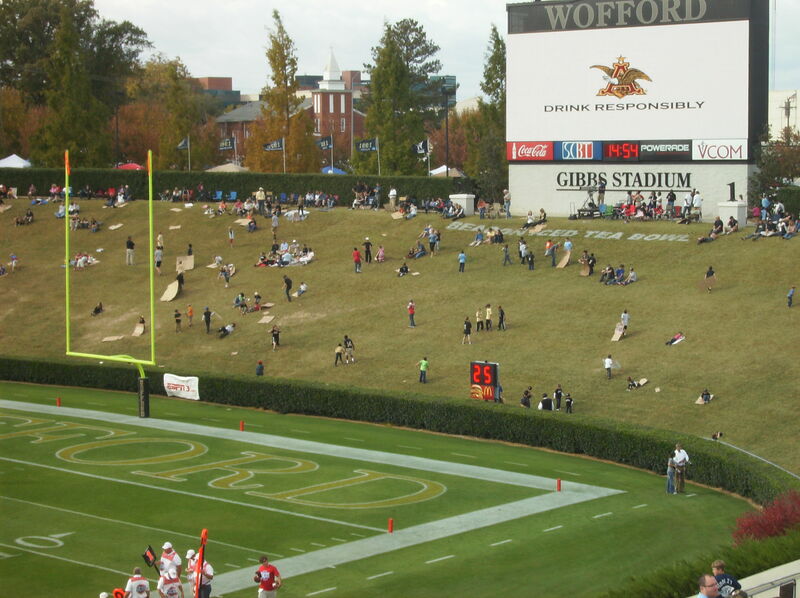 — I felt that offensive pass interference could have been called on Wofford on the pass that preceded the field goal; if it had been called, the Terriers would have only led 21-7 at halftime instead of 24-7. As it was, Domonic Jones actually got a piece of the ball on Wofford’s field goal, but it went through the uprights anyway. You don’t see that every day. — The Citadel suffered yet another major injury on Saturday, as left guard Keith Carter ruptured his Achilles’ tendon. I was worried when I saw him sitting on the bench during the game. His absence on the o-line will be felt. Carter is a fine player and also serves as one of the team’s captains. He is having surgery on Friday. — The bye week gave the coaches a chance to add a few new plays to the offensive repertoire. I would like to see that inside trap run (not sure what else to call it) more often going forward. It was frequently effective, and has “breakaway” potential, too. — James Riley’s first game as a Bulldog was quite impressive. He had 12 tackles, with 2.5 for loss (including a sack). You could make an argument that he was the best defender on the field, for either team. — It was nice to see The Post and Courier send a reporter and a columnist to the game. I would assume Clemson playing on Thursday night may have had something to do with that, but no matter. While it is true that the Bulldogs have improved, contract extensions generally aren’t an immediate priority when the team has lost four of five contests, including one to an opponent the head coach has not beaten in eight tries, and with three games still remaining in the season. That isn’t meant to be a slap at Kevin Higgins, by the way. He may eventually get an extension, and he may well deserve it. I’m just suggesting that folks at The Citadel may not appreciate Sapakoff making such a pronouncement, particularly as his forays into the world of Bulldog athletics are limited at best. The statement was perhaps a bit harsh, but I knew where he was coming from. It was a largely docile crowd for major portions of the game. 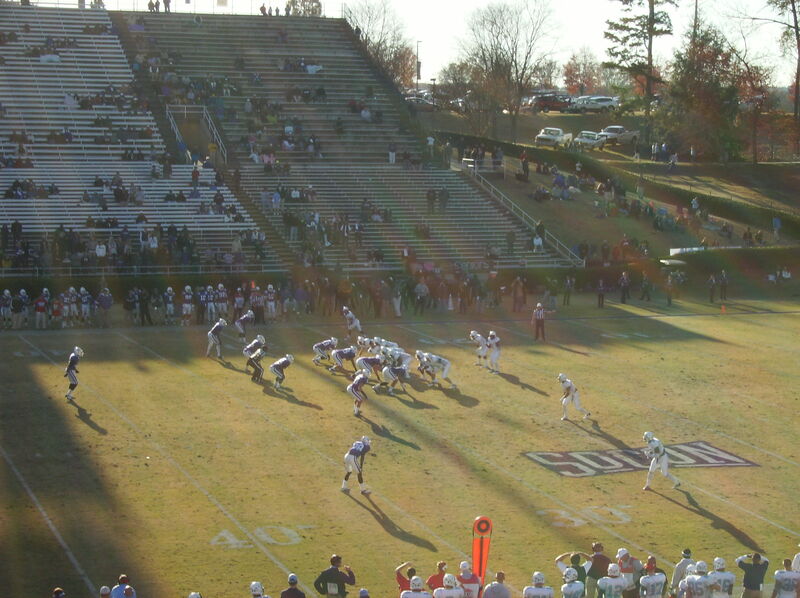 There were 9,658 fans in attendance, the most people to see a game at Gibbs Stadium all season. That high-water mark could be attributed to homecoming, and to a sizable number of blue-clad fans in the visitors’ section. 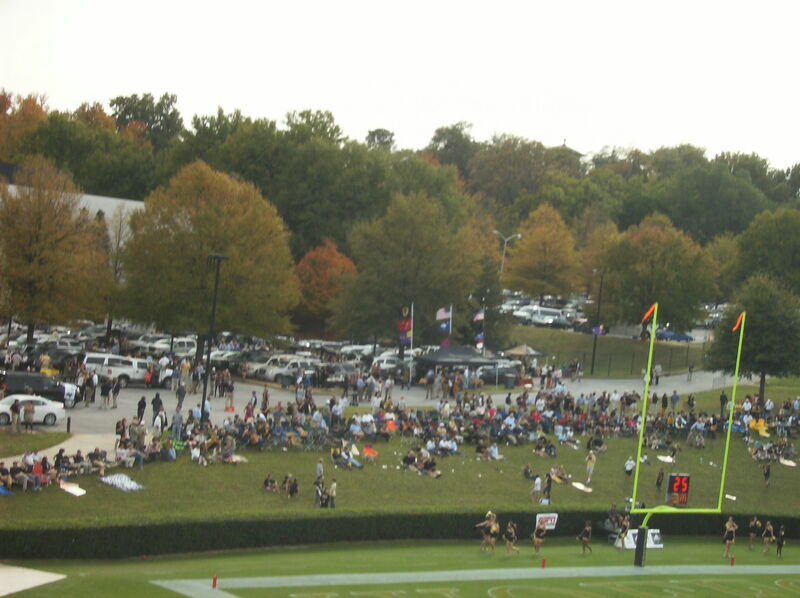 The atmosphere at many football games can be described as festive or intense; at Wofford, it is pastoral. Having said that, I enjoyed my trip to Spartanburg. I didn’t like the final score, but you can’t have everything. Okay, pictures. I took a ton of bad photos on Saturday. My ability to take out-of-focus shots is almost unmatched. The least embarrassing of the lot can be found below. The Citadel vs. Western Carolina, to be played at historic Johnson Hagood Stadium, with kickoff at 2:00 pm ET on Saturday, October 13. The game will not be televised, although it will be streamed on Bulldog Insider (subscription service) and can be heard on radio via the twelve affiliates of The Citadel Sports Network. Danny Reed (the “Voice of the Bulldogs”) will call the action alongside analyst Josh Baker, with Lee Glaze roaming the sidelines and Walt Nadzak providing pre-game, halftime, and post-game commentary. Hey, read about The Citadel’s outstanding punter, Cass Couey. He likes to fish! The game against Western Carolina isn’t about a learning experience, or moving forward, or anything like that. There is only one goal for the matchup with the Catamounts, and only one acceptable outcome. The Citadel must win this game. That was true then, and it is true now, though the circumstances are not quite the same. The Citadel was 2-4 at this point last season, having lost two straight games, and played WCU on the road. This year, the Bulldogs are 3-3, but have lost three consecutive contests, with the last two games being dispiriting affairs. 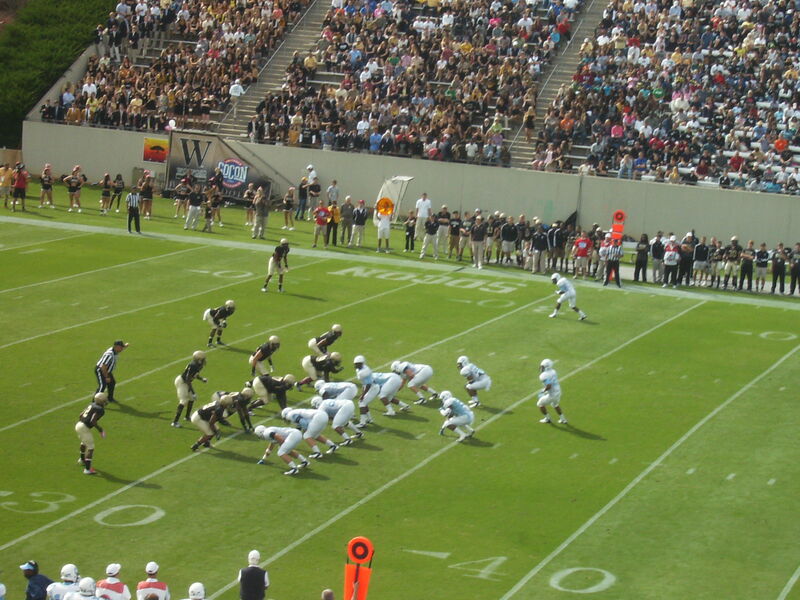 The seventh game of 2012 will take place at Johnson Hagood Stadium, on Parents’ Day. 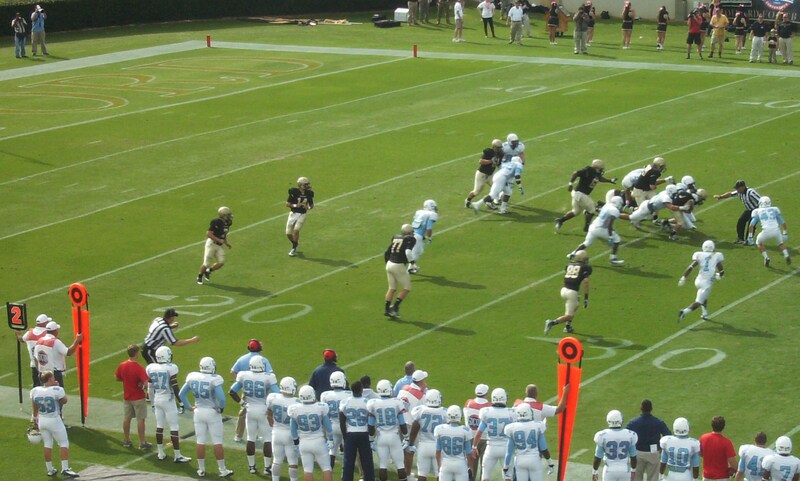 Last year, The Citadel took care of business against the Catamounts, winning 35-7. What about Saturday’s game? I think at this point The Citadel is a known quantity on defense. It is a unit that has some limitations, including a lack of experience in key spots. To be fair, though, that was the concern heading into the season. For example, I believe most people liked our starting linebackers but were worried about depth at that position. Now the Bulldogs have lost two of those three players for the season. That is a problem and will continue to be one for the rest of the campaign. It doesn’t mean the defense is a lost cause; far from it. There is still talent on that side of the ball. The main problem on D against Samford, in my view, was that the defensive line did not have a particularly good day, getting very little pressure on Samford quarterback Andy Summerlin, and not having much luck against the run either. I think the d-line is better than that one game. That was certainly the case against Georgia Southern and Appalachian State. It is also true that against Samford, the defense didn’t get any help from the offense, and that took its toll in the second half. The offense’s play was the really disappointing thing about the game in Birmingham. 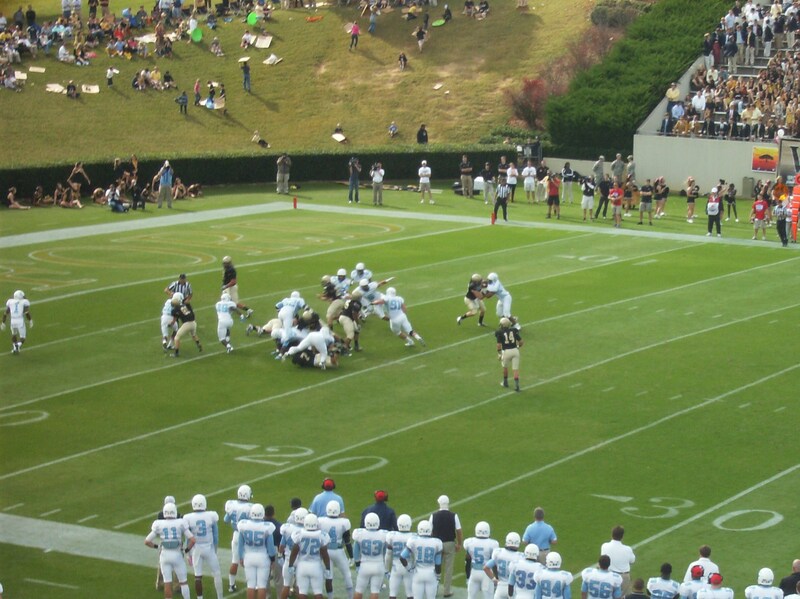 It wasn’t the first time The Citadel had struggled offensively against Samford, though. In three games against Samford since moving to the triple option, The Citadel is a combined 6 for 39 on third-down conversions. That is…not good. Samford’s “bear” front basically forces a team to go outside or over the top to beat it. A team that is successful in doing so can break a lot of big plays. Georgia Southern couldn’t convert on third down against Samford either (0 for 10), but had three long touchdown runs. In the last three games against Samford, The Citadel has only had four plays from the line of scrimmage that went for longer than 20 yards. Our goal going into the game was to be aggressive…We went for it on fourth-and-one because we wanted to send a message out to our guys that we wanted them to play aggressive. We were fortunate to get the first down. The very next play we had a play-action throw, as Ben Dupree hit Matt Thompson for a 48-yard strike and we got some momentum going there. We had two legitimate shots for touchdowns that we just didn’t throw the ball real well or we dropped it. We ended with six dropped balls on the day. Several of those being real tough catches, but we needed to make those plays. Additionally in the second quarter Dupree threw an interception off a scramble and that hurt us [it certainly did, as it was returned for a TD]. Third down conversions were not good…We didn’t do a good job at continuing drives, as we ended up going 1-14 on third-down conversions. If we would have moved the ball better in the first half, it would have taken pressure off of our defense. That comes close to summing up the offense’s afternoon. Before moving on to the Western Carolina game, a special teams observation. The Citadel had a field goal blocked against Samford, never a good thing, but paid back that mishap with its own field goal block a short time later. It was yet another rejection for special teams stalwart Domonic Jones. He also got a hand on a second Samford field goal attempt that eventually sailed wide. In his last 17 games, Jones has blocked six punts and two field goal attempts (not counting the deflection against Samford). He blocked two punts against Jacksonville in last year’s opener, and would later block a punt versus Elon and another in the VMI game (of course, you had to take a number to do that against the Keydets). 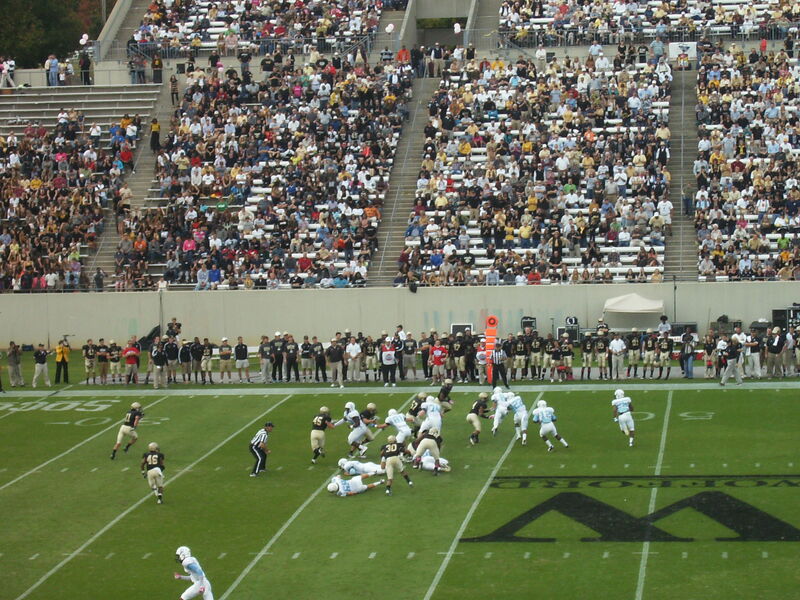 Jones has burned Appalachian State in consecutive seasons, blocking a punt for a TD in both the 2011 and 2012 games against the Mountaineers. His first career block of a field goal attempt came this year and was a critical play in the Bulldogs’ victory over Georgia Southern (and may have influenced the Eagles’ other FG attempt, a last-second miss). Blocking a kick every other game is rather remarkable, and while Jones has drawn some recognition for his kick-blocking exploits, I’m not sure he has really received his just due. I think the SoCon needs to consider adding a place on its all-conference team for a special teams performer who isn’t a kicker or return man. Jones would be an obvious candidate to fill that spot. – An 18-game losing streak in SoCon play, which is the longest current streak of futility for any FCS team in its own conference. 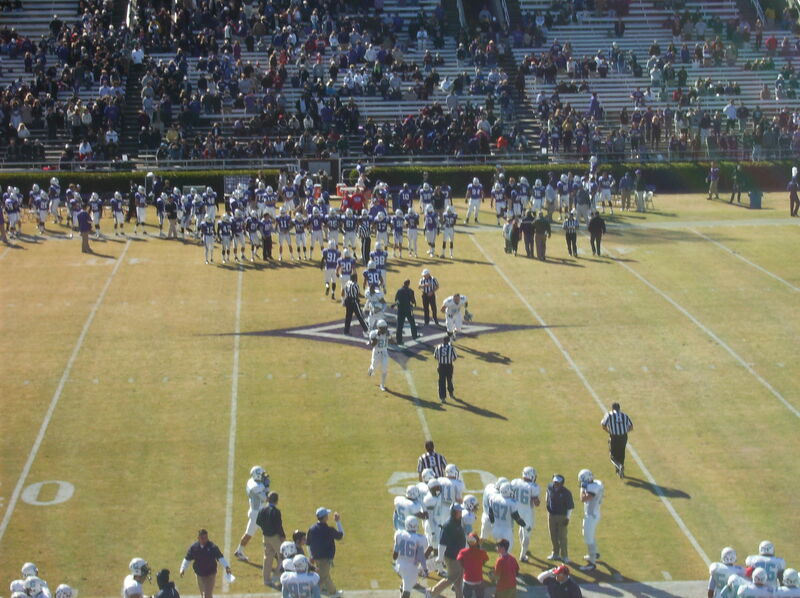 The last time Western Carolina won a league game? 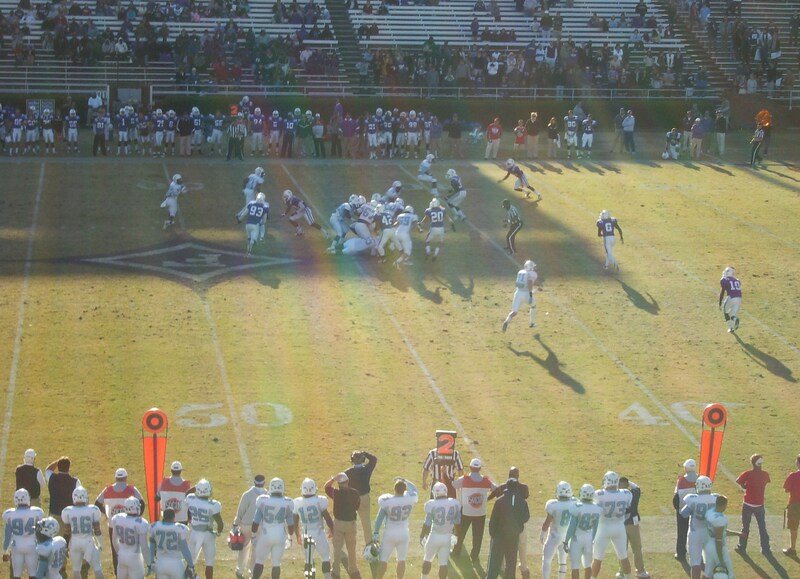 Well, it was the last time WCU played at Johnson Hagood Stadium. 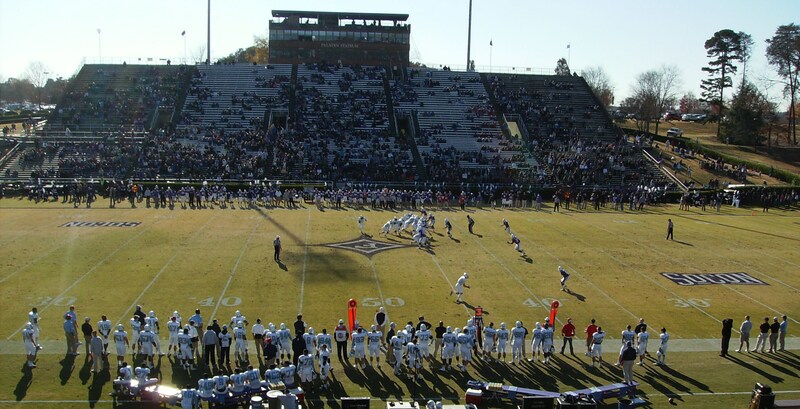 – That win over The Citadel in 2010 is also the last time the Catamounts defeated an NCAA Division I opponent, and the last time WCU won a road game. 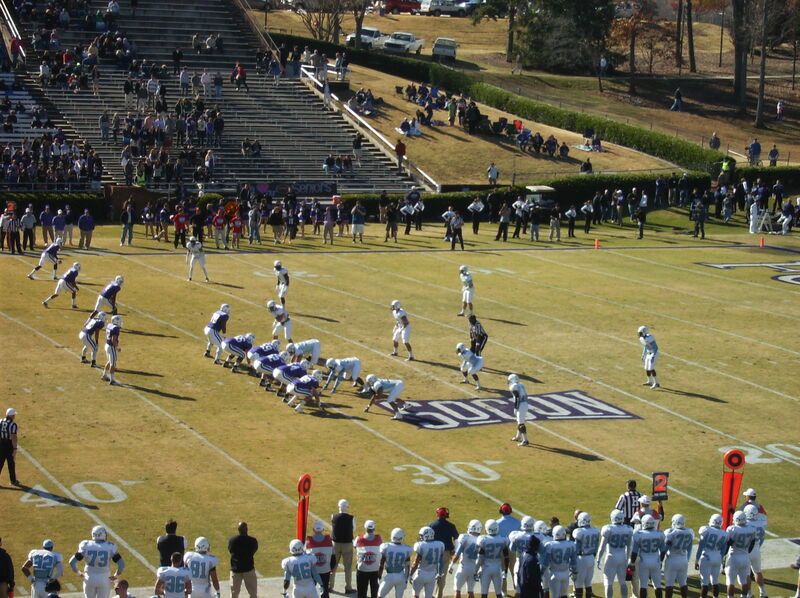 – Western Carolina lost 20 SoCon games in a row from 2005-08. – WCU has lost five straight games this season after winning its opener against Mars Hill. – The Catamounts are 4-29 in their last 33 road contests, a stretch that dates back to 2005. WCU’s current road losing streak stands at 11 games, which is the sixth-longest such streak among FCS schools (Idaho State has lost a staggering 36 consecutive road games). 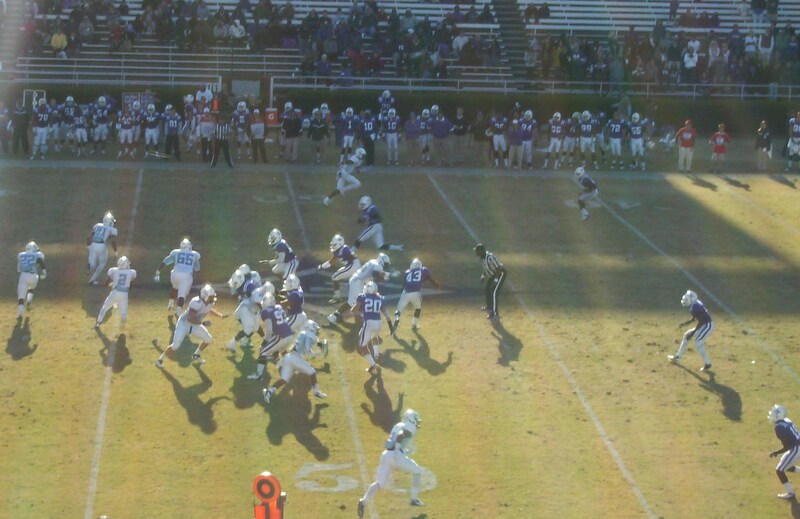 – WCU beat Mars Hill 42-14. The fourteen points allowed by the Catamounts marked the fewest points scored by an opponent since, you guessed it, the 2010 game against The Citadel (a 24-13 WCU victory). 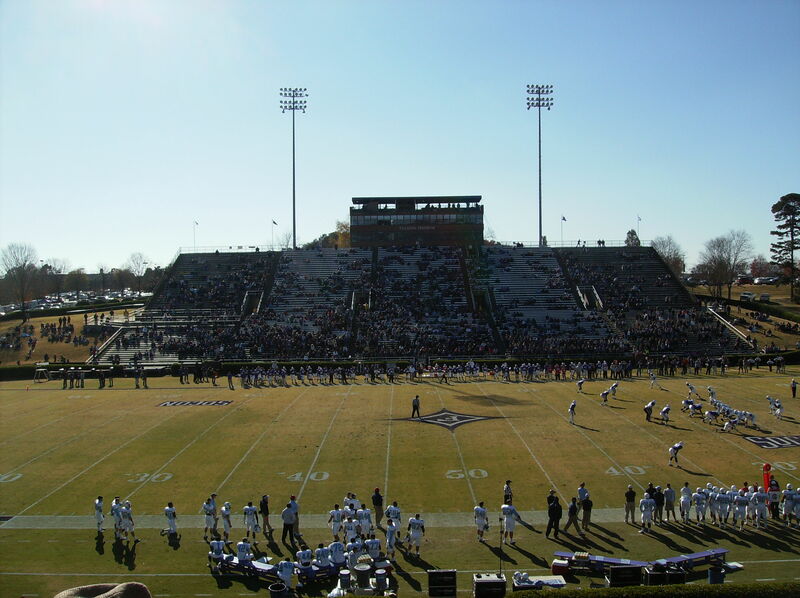 – Western Carolina has lost 47 of its last 50 Southern Conference games. 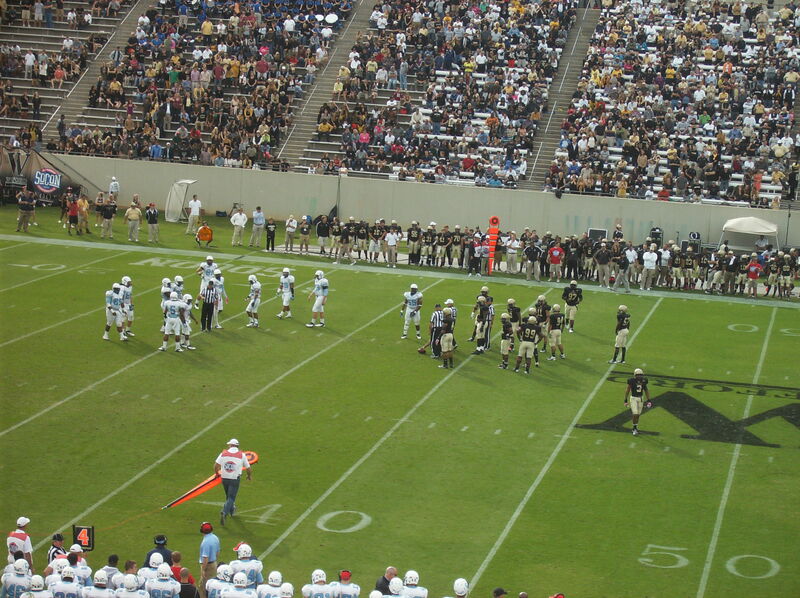 Two of the three victories have come against The Citadel. On the bright side, most observers applauded Western Carolina’s selection of Mark Speir as its new head coach. Speir was a student assistant at Clemson during the latter part of the Danny Ford era in Tigertown. He then moved to Western Carolina for several years before three-year stops at Presbyterian and Elon. He had been on the Appalachian State coaching staff since 2003, and the recruiting coordinator for Jerry Moore since 2004. That sounds like the opposite of, say, Charlie Weis. Being the opposite of Charlie Weis as a football coach strikes me as a good place to be (although Weis apparently has a great agent). Speir clearly has his work cut out for him, though, especially this season. This year’s WCU outfit has been okay offensively, but on defense…not so much. The aforementioned game notes actually include a paragraph entitled “Western Carolina’s Troubles With The Triple Option”. I couldn’t wait to read that section. 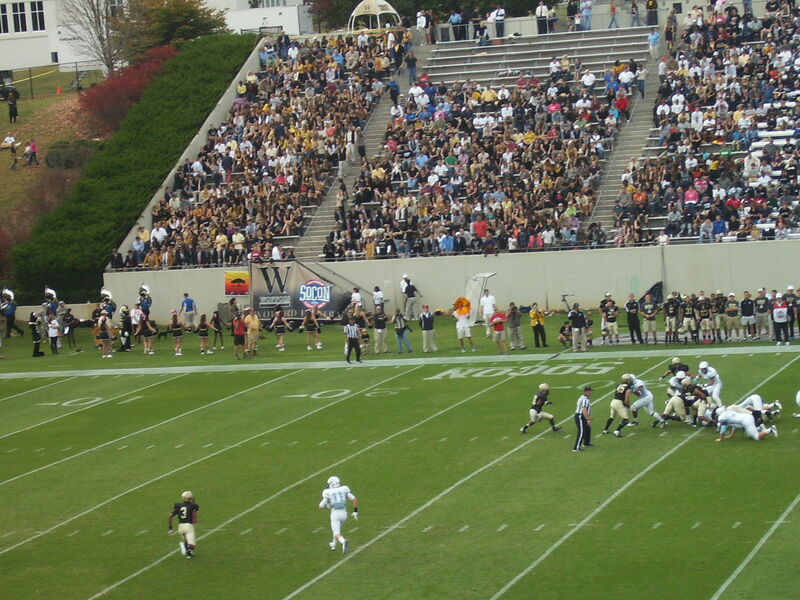 – Wofford rushed for 590 yards against the Catamounts, averaging over 8.5 yards per carry. Three Terriers rushed for over 100 yards. 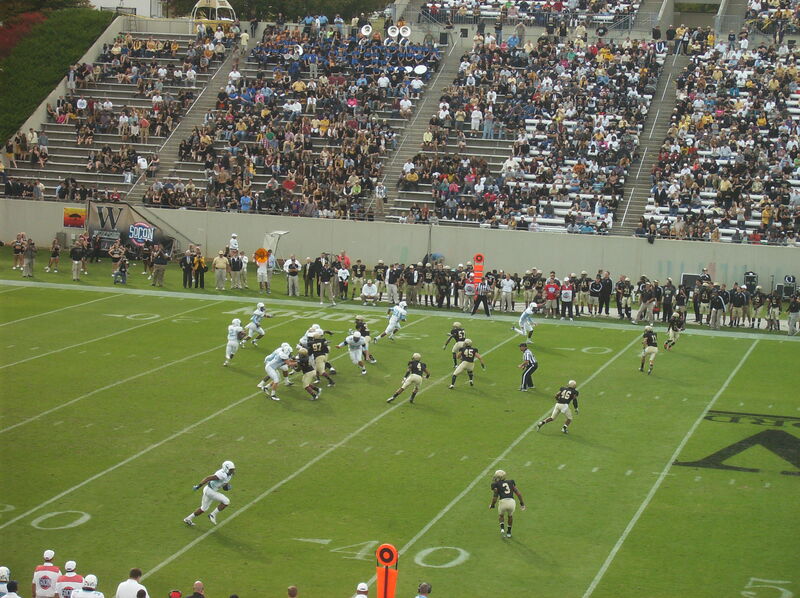 – Georgia Southern rushed for 614 yards against WCU, averaging over 7.7 yards per carry. GSU had five different ballcarriers rush for at least 89 yards. – You didn’t have to run the triple option to run on Western Carolina, though. Furman averaged 7.9 yards per carry in its victory over the Catamounts; the Paladins’ Jerodis Williams rushed for 239 yards on only 18 carries. Williams also added a 100-yard kickoff return for a TD. – Samford running back Fabian Truss rushed for 180 yards against Western Carolina. In that Samford game, though, Western Carolina actually had the lead in the fourth quarter before giving up 15 unanswered points and losing 25-21. Still, that level of competitiveness should get The Citadel’s attention. WCU opened the scoring against Samford with a fumble recovery for a touchdown, one of three fumble returns for TDs the Catamounts have had this season. 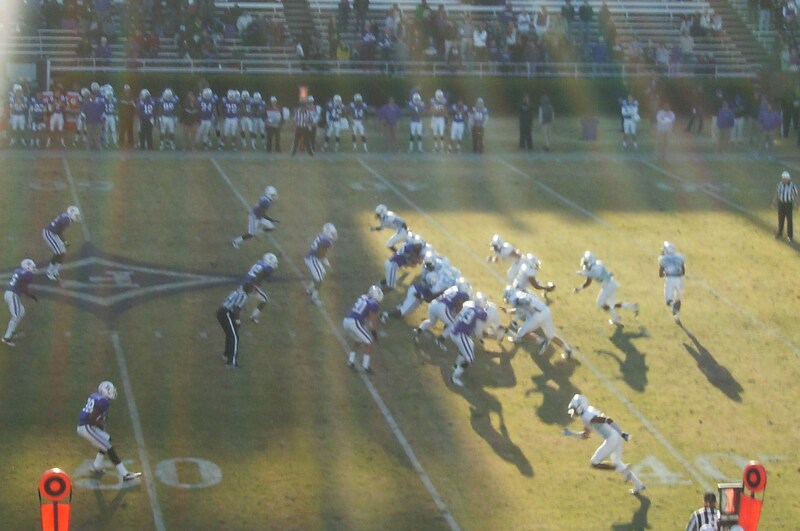 Maybe it isn’t the world’s greatest defense, but it appears WCU’s D is at least opportunistic at times. 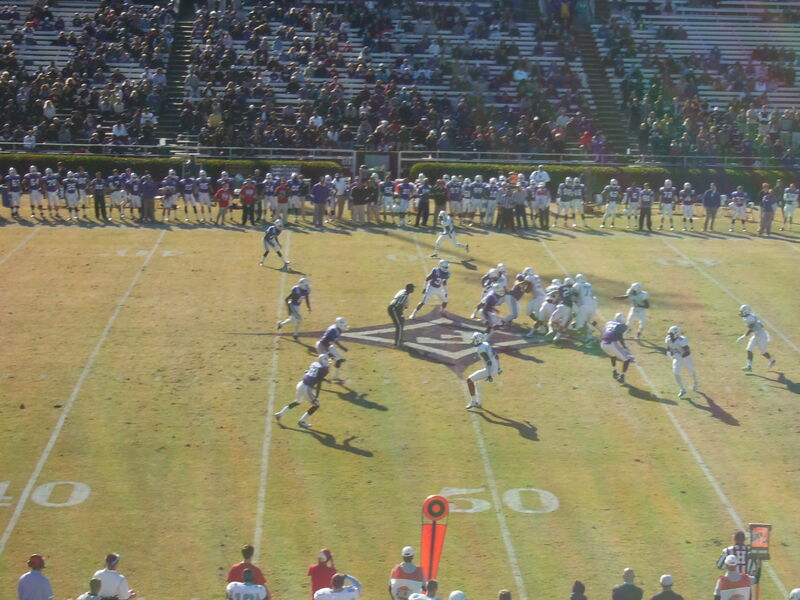 Western Carolina runs a spread offense, not unlike that of Appalachian State. Eddie Sullivan has received the bulk of the snaps at quarterback, but Troy Mitchell will also see a lot of time. 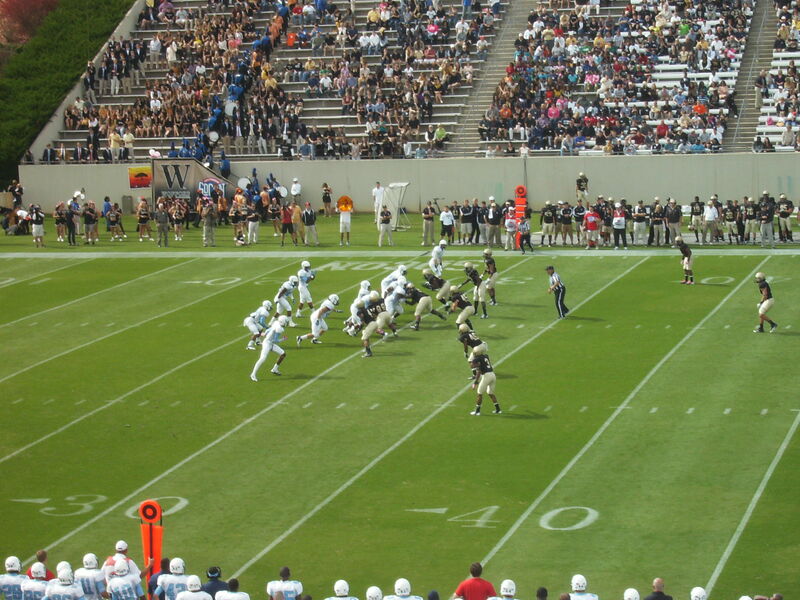 Against Georgia Southern, the two were interchanged for each other on almost every down, and occasionally were in the backfield together. The Catamounts have several running backs; the two-deep’s listed starter, Michael Vaughn, has fewer rushing yards than three of the other RBs. Jacoby Mitchell is Western Carolina’s leading receiver, but keep an eye on 6’4″ freshman Spearman Robinson, a native of Greenwood. There appears to be a bit of uncertainty on the left side of WCU’s offensive line, with both the LG and LT spots on the two-deep listed as an “or” situation. Josh Weinberg is a 260-lb. true freshman who will start at right tackle. On defense, Western Carolina’s best player is linebacker/tackling machine Rock Williams, a preseason second-team All-SoCon selection. Randy Pressley isn’t listed as a starter at linebacker, but he made 16 tackles against Georgia Southern last week, including the Catamounts’ only tackle for loss. WCU’s defensive line is not particularly large, as only two of the nine players on the depth chart weigh more than 265 lbs. and four of them weigh less than 250 lbs. The secondary is young; two of the starters are freshmen, and two others are sophomores. Western Carolina punter Clark Sechrest is having a good year thus far. He presents a different challenge for Domonic Jones and company in that he is left-footed and can employ the “rugby style” of punting. He is also the backup placekicker. According to WCU’s website, he kicks field goals and PATs with his right foot. 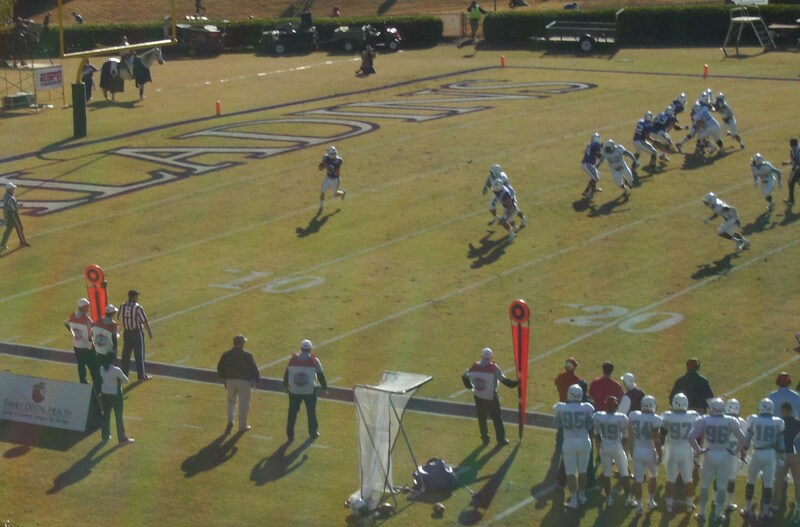 The regular placekicker for WCU, Richard Sigmon, is 4 for 8 on FG attempts with a long of 45. He has had one kick blocked. Sigmon is also the kickoff specialist. Four of his 27 kickoffs have resulted in touchbacks. 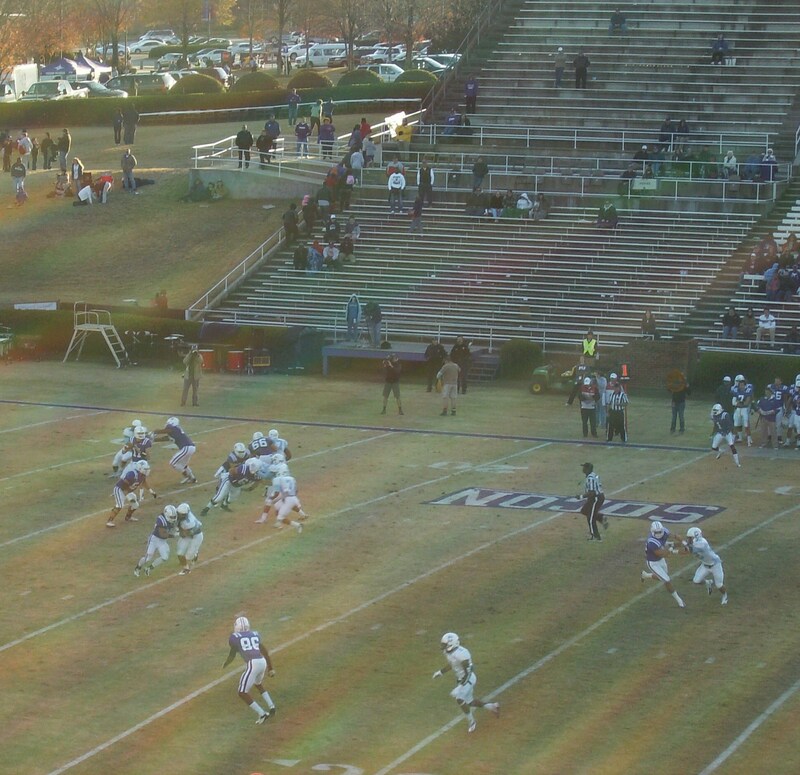 Western Carolina’s punt return unit is not particularly strong. 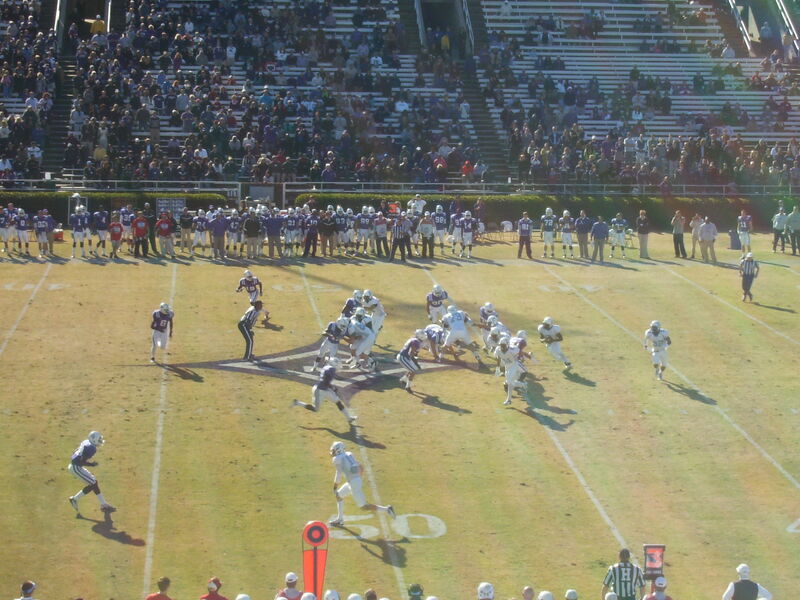 On kickoff returns, the long for the season for the Catamounts is 38 yards. I need a ruling. Is Saturday’s game Parent’s Day (as noted on the school’s game preview) or Parents Day (on the website’s season schedule)? Actually, I think Parents’ Day would be more correct than either. The press release from External Affairs refers to “Parents’ Weekend” throughout, except for (of course) the title of the release (“Parents Weekend”). I’m going to go with Parents’ Day on this blog post. Yes, I know nobody cares. What we really care about is the action on the field. The Citadel needs to win this game. It doesn’t really matter how, although I would personally be in favor of a blowout victory in which everyone gets to play a lot and the cadets all get overnights. Hey, I’m generous. Also, I remember Parents’ Day 1986 all too well. Not a good weekend. There have been some good Parents’ Day games (the most famous being The Citadel’s 1950 victory over South Carolina), but lately things haven’t gone the home team’s way at what I call the “celebration” games — Parents’ Day and Homecoming. 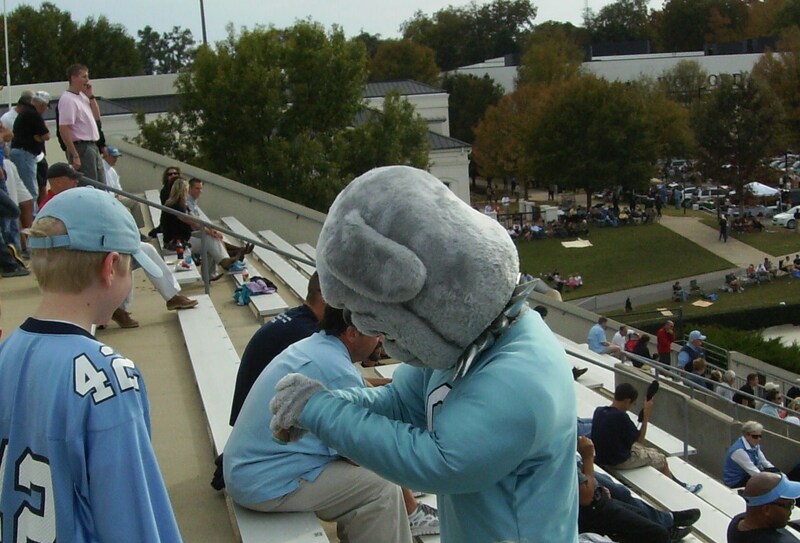 The Citadel has lost five consecutive celebration games. 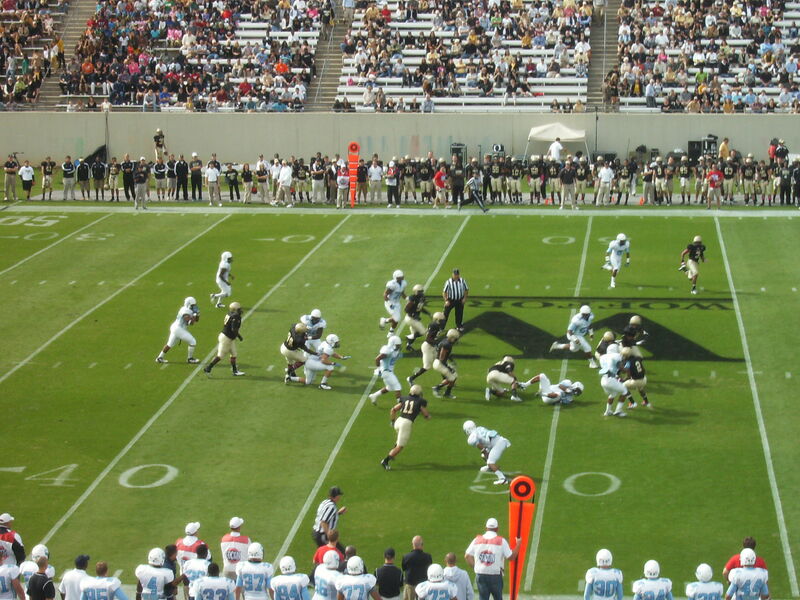 Since 1953 (when the modern yearly Parents’ Day/Homecoming advanced schedule began), The Citadel has never lost six consecutive celebration games. 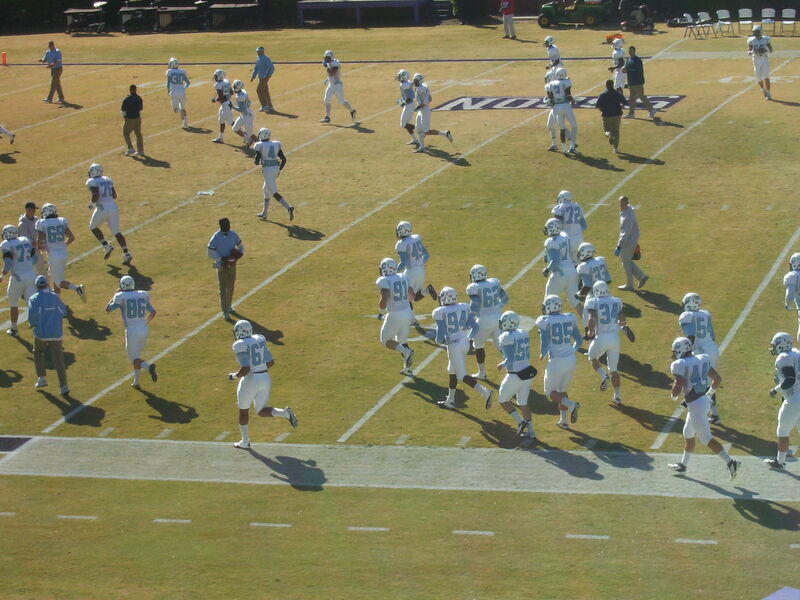 Incidentally, in none of those five losses did The Citadel wear its “traditional” uniform of light blue jerseys/white pants. Sure, that is just a coincidence. Still, perhaps Kevin Higgins’ Leadership Council can get together and appease some old alums while reversing a little karma. Just a suggestion. I think the Bulldogs will win on Saturday, although I’m not overly confident. Nobody should be confident, given the results of the last two weeks. It is also worth pointing out that despite Western Carolina being a terrible football program for a number of years now, the Catamounts have won two of the last three games in this series. WCU has players on its roster who know they can beat The Citadel. 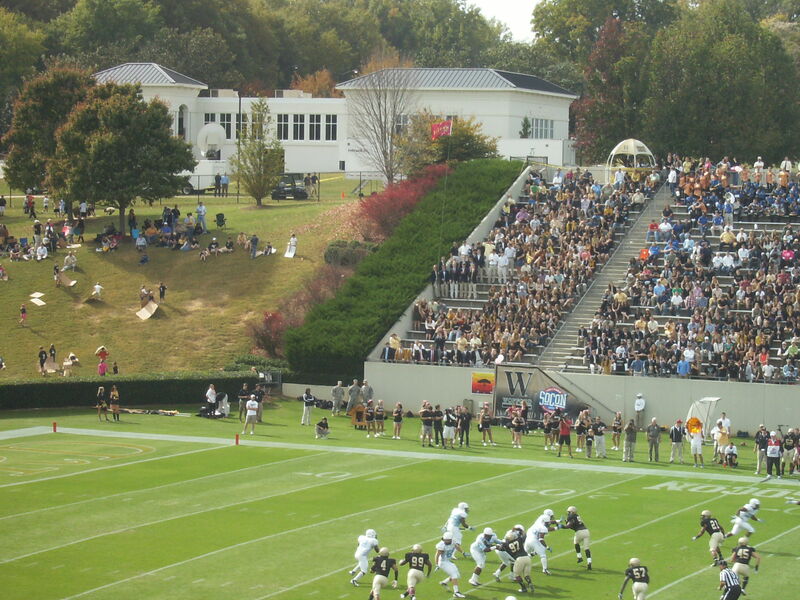 They will be more confident against the Bulldogs than any other SoCon team. On the other hand, the stats don’t lie. 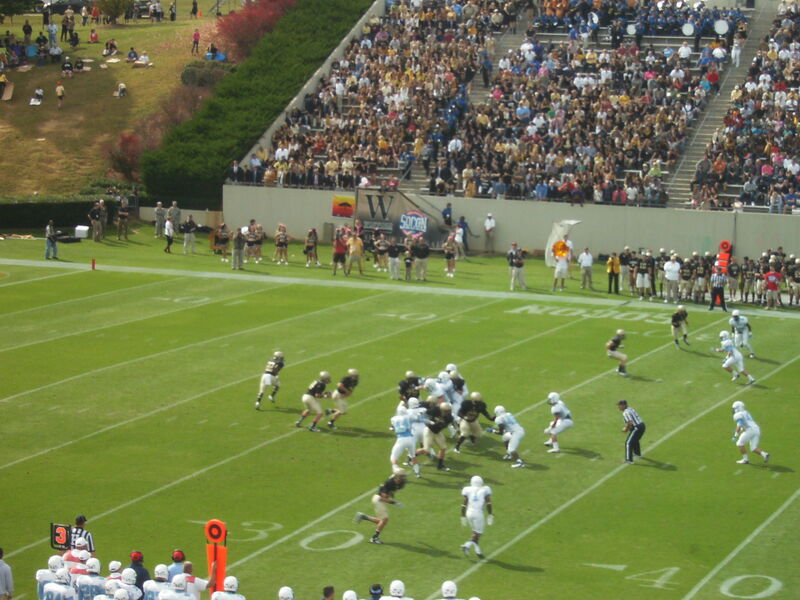 League opponents have run the ball at will against Western Carolina. Saturday’s game is a good opportunity for Triple O’Higgins to put up some big numbers, and for the players to regain some lost confidence. Perhaps the fans can regain some lost confidence as well. Congratulations to all the seniors as they get their rings, with a gentle reminder that it isn’t over yet. There are still diplomas to be acquired. Congratulations also to the freshmen who have made it to this benchmark. You still have a long way to travel, but you’ve survived the most stressful part of the trip. I hope everyone has a good time this weekend. Let’s win this game. 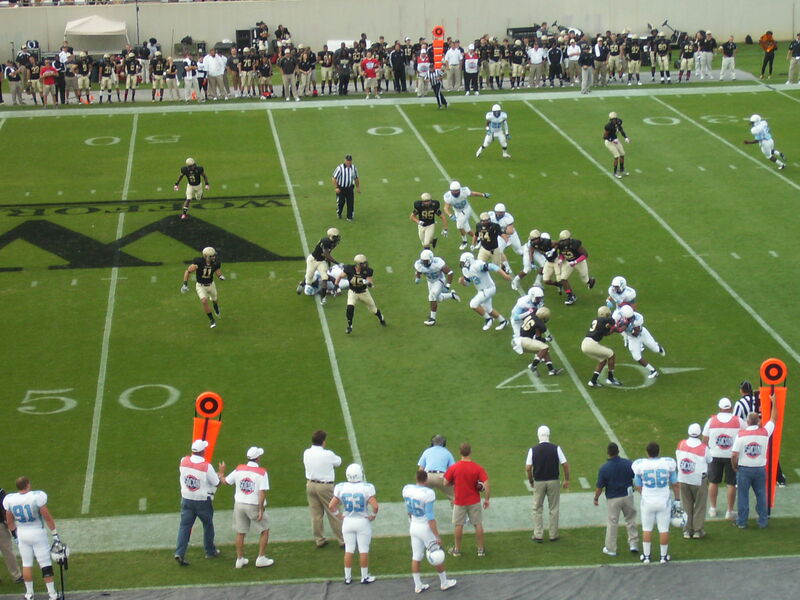 The Citadel at North Carolina State, to be played at Carter-Finley Stadium, with kickoff at 6:00 pm ET on Saturday, September 22. The game will be streamed on ESPN3.com, with play-by-play from Mike Gleason, analysis by Paul Maguire, and sideline reporting from Sarah Stankavage. 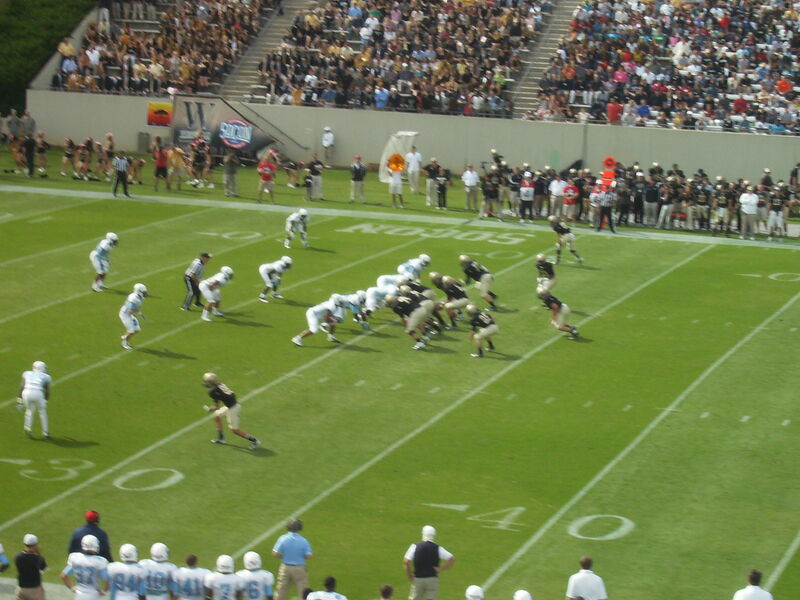 The contest can also be heard on radio via the twelve affiliates of The Citadel Sports Network. Danny Reed (the “Voice of the Bulldogs”) will call the action alongside analyst Josh Baker, with Lee Glaze patrolling the sidelines and Walt Nadzak providing pregame, halftime, and postgame commentary. Bulldog Insider will also provide free audio. 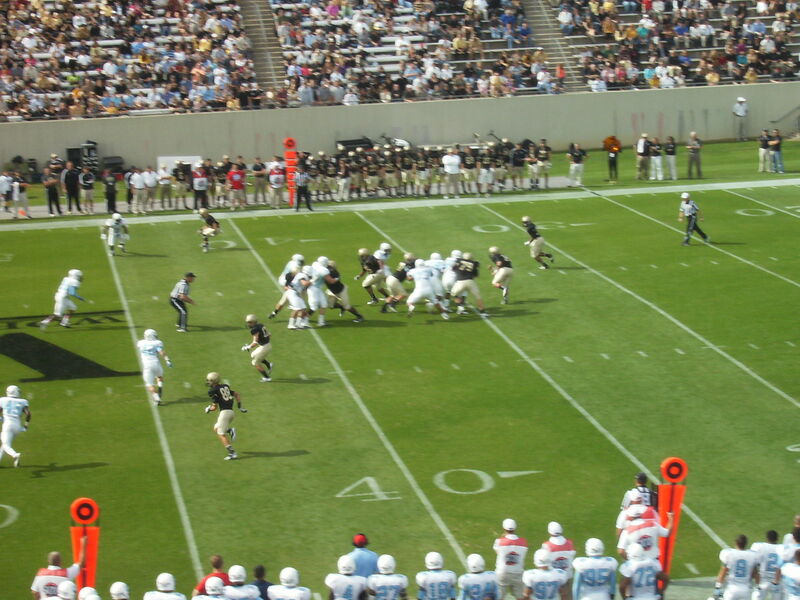 The Citadel Sports Network broadcast can be heard on the radio in Carter-Finley Stadium via 90.3 FM. When the game started I was wandering around the extremely impressive Oriental Institute on the campus of the University of Chicago (a school that was once a member of the Big 10, by the way, and is still a member of that conference’s academic consortium). By the time it ended I was at the underrated Loyola University Museum of Art, just off of Michigan Avenue. Hey, I’m not just a sports geek; my nerdiness is multi-faceted. The Oriental Institute wasn’t quite as impressive, however, as The Citadel putting FIFTY-TWO POINTS ON THE BOARD IN BOONE. Fifty-two points…and in only three quarters! Three Bulldogs rushing for over 100 yards? Another with over 100 receiving yards? Unbelievable, and also unprecedented, for while The Citadel did have three 100-yard rushers in a game against VMI in 1998, there was no 100-yard receiver in that particular contest. I’ve spent the past couple of days trying to reconstruct the App State game before taking a look at this week’s game against North Carolina State. Kevin Higgins may give his charges only 24 hours to enjoy a victory before focusing on the next game, but I can take more time to review things. The highlights were great fun to watch. The two TD runs by Ben Dupree, the long pass plays, the blocked punt for a TD, the sacks/pressures, and the “truck jobs” by Rickey Anderson and Van Dyke Jones — they were all good, especially with Danny Reed roaring in the background. I think everyone by now has a good idea of what happened in the game, so I’m not going to rehash all of it. I will say, though, that while the offense was responsible for 45 points (the punt block providing the other TD) and an astounding 618 yards of total offense, it seems to me the defense may have been the more consistent unit against the Mountaineers. I’m not sure the offense’s productivity last Saturday is sustainable, at least not in the manner it was accomplished. 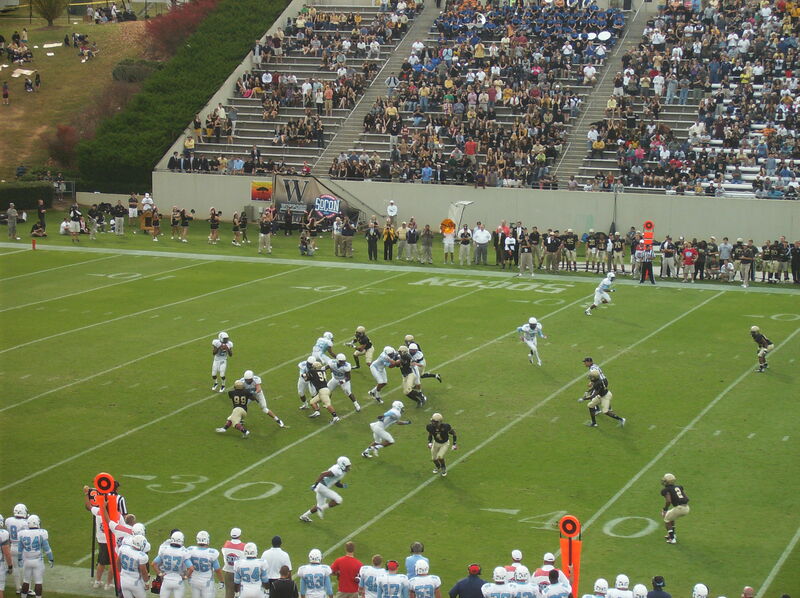 The Bulldogs were only 3 for 14 on third-down conversions against Georgia Southern. That won’t be good enough against Appalachian State. This is something I actually got right. The Citadel turned that third-down conversion stat on its head, as it went 11 for 14 on third-down conversions against the Mountaineers. That is quite a switch, but a closer look tells a more remarkable tale. 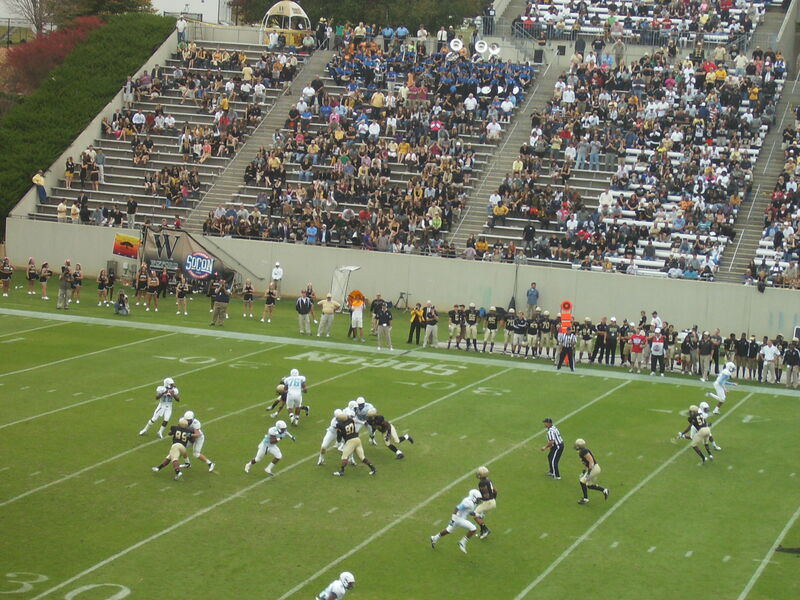 Four times against Appalachian State, the Bulldogs were faced with a third down needing six yards or more to move the chains. In fact, all four of those conversion attempts were 3rd-and-8 or longer. 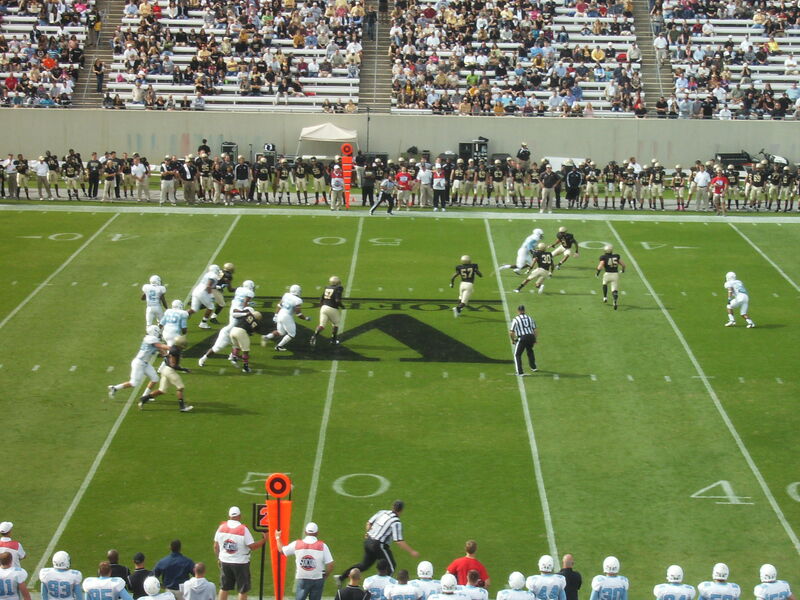 The Citadel’s average gain on the four plays? 36.25 yards, with two of them resulting in touchdowns (Dupree’s long scampers) and another leading to a first-and-goal (the 32-yard pass reception by Domonic Jones). That is an absurd success rate, both in terms of percentage and resulting yardage. 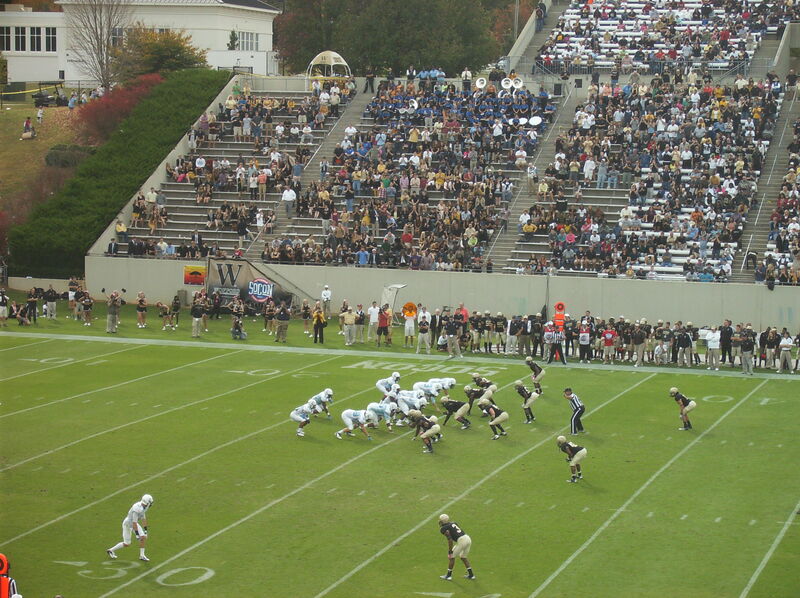 In contrast, the Bulldogs had eight third down plays against Georgia Southern in which they needed to gain at least six yards for a first down. The Citadel converted only one of those against the Eagles (the first TD of that contest, a 26-yard pass from Dupree to Jones on a 3rd-and-7). 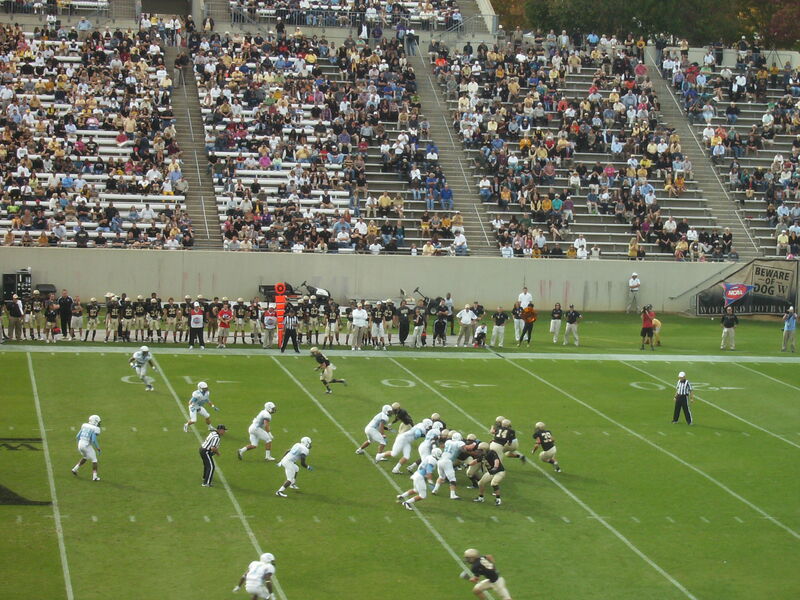 When The Citadel played Charleston Southern, the Bulldogs converted twice on third-and-six but were 0-3 on third-down conversion attempts longer than that (and 3-for-9 overall). I’m not trying to take anything away from the offense. 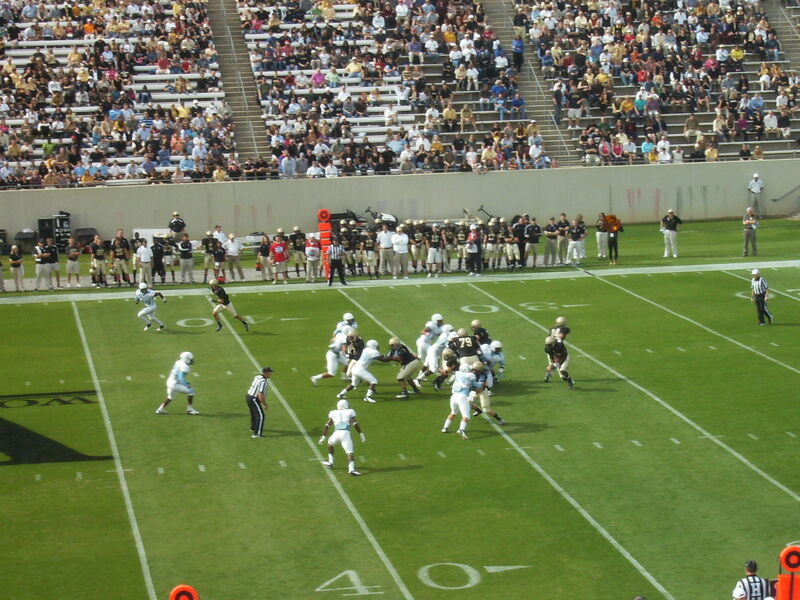 After all, The Citadel only faced a third-and-long situation four times in twelve drives, which is excellent. 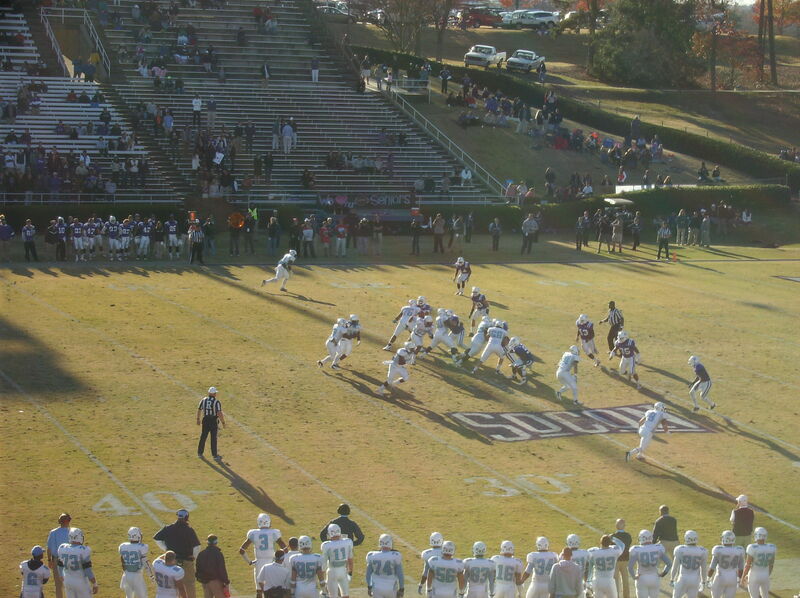 However, those conversions led to 21 of the Bulldogs’ 38 first-half points. It could have been a very different game if The Citadel had converted on, say, only one of those long-yardage situations. 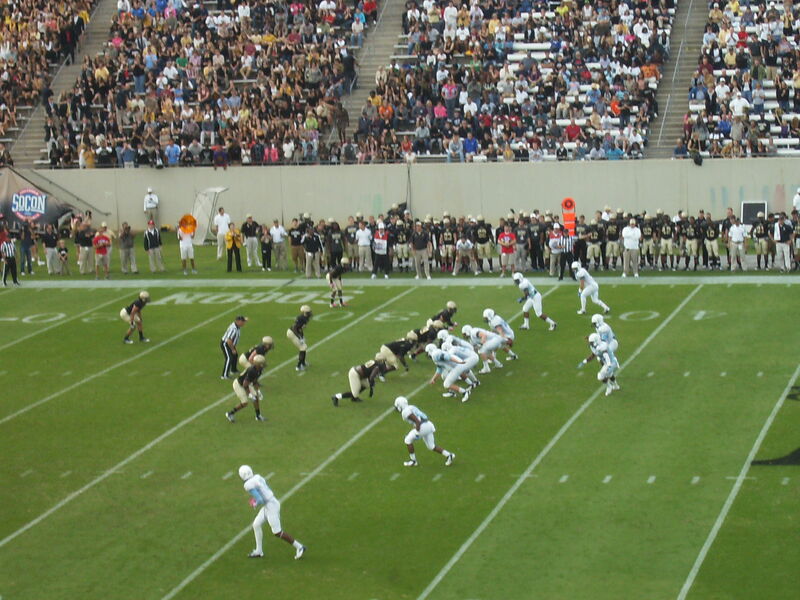 Going forward, The Citadel can’t count on that type of success on third-and-long. It’s nice to know, though, that the Bulldogs are capable of making big plays on offense when necessary. Another huge plus: no turnovers. As for the defensive effort against the Mountaineers, it was just what the doctor ordered. 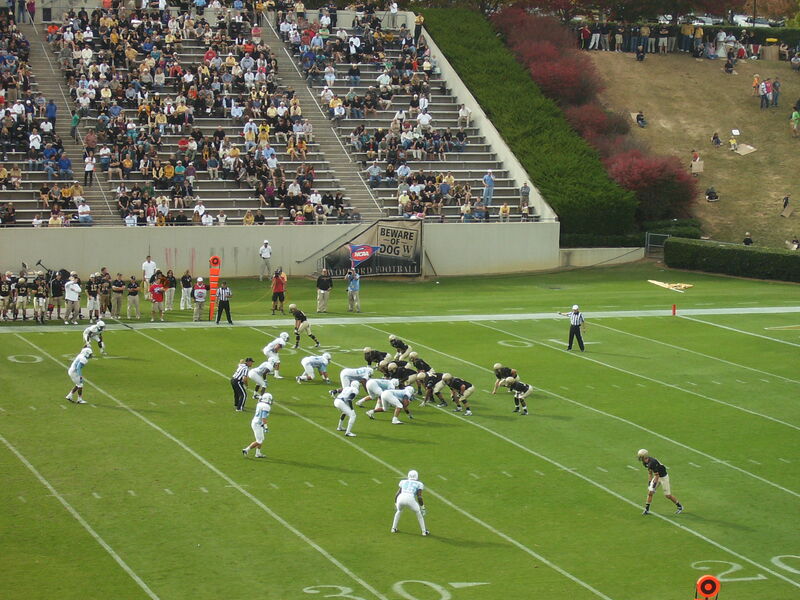 Appalachian State had averaged over 42 points per game in the previous six contests against the Bulldogs at Kidd Brewer Stadium, so holding App to 14 points through three quarters was a welcome change. 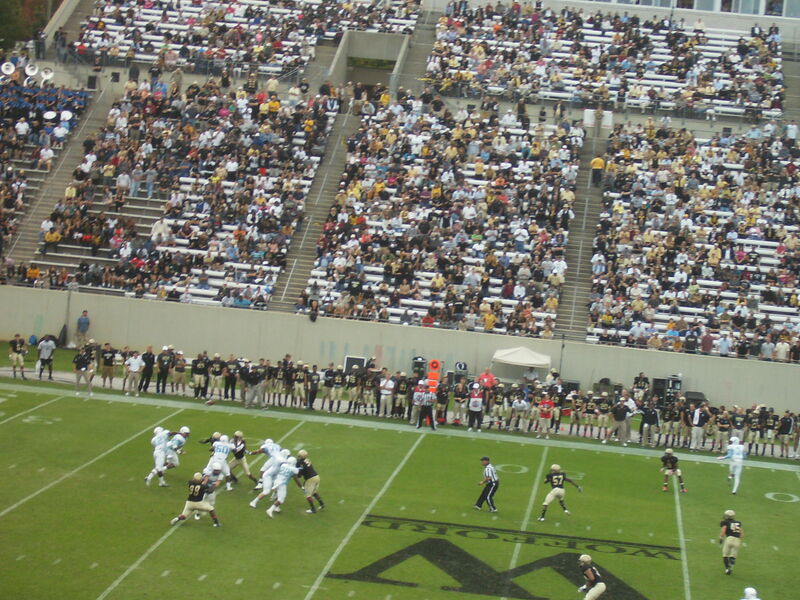 The Mountaineers had nine full possessions in those three periods and were limited to 239 yards of total offense. Five of the nine App drives ended in punts, one in an interception, and another on a lost fumble. Six of those non-scoring drives were over in five or fewer plays, so the defense played its role in The Citadel’s huge edge in time of possession (the Bulldogs had the ball for over 38 minutes in the contest). The defense did an excellent job preventing Mountaineers QB Jamal Jackson from making big plays (his longest pass completion of the day was only 15 yards). I am a little puzzled by App’s seeming unwillingness to throw the ball deep. Perhaps it was more a case of being unable than unwilling. The Citadel got a lot of pressure on Jackson when he did attempt to go long (Mark Thomas put his stamp on the game twice in this respect). 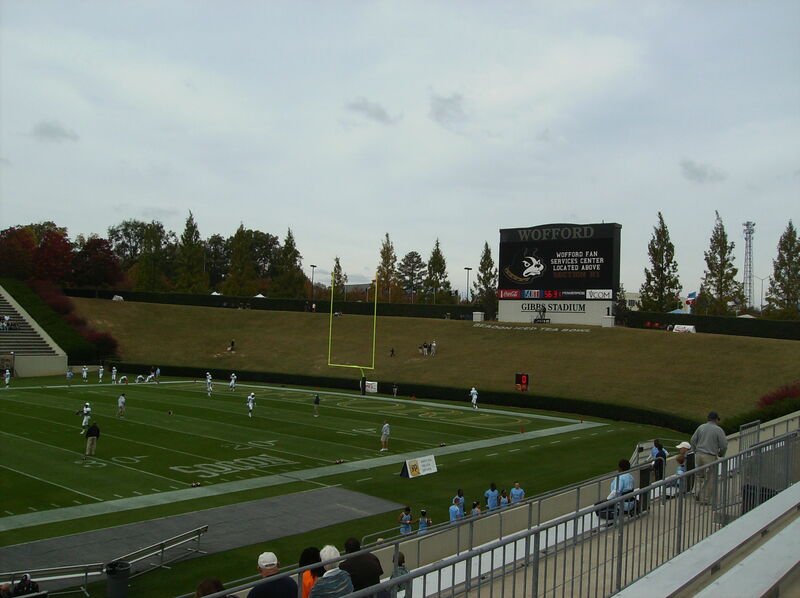 Now the Bulldogs will play a football game in another city in North Carolina. It won’t be a conference game, though. North Carolina State is this year’s FBS opponent, as The Citadel will pocket $375,000 for appearing at Carter-Finley Stadium this Saturday. – Before Nick Foles was selected in the third round of the most recent NFL draft, Arizona had not had a QB picked in the draft since 1985. The Wildcats haven’t had an alum start a game at quarterback in the NFL since 1974. – T.J. Yates started five regular-season games (and two playoff games) for the Houston Texans last season, which was remarkable enough. More remarkable, perhaps, is that he became the first UNC player to ever start a game at quarterback in the NFL. – Anthony Wright, with 19 career starts, is one of only two former South Carolina players to start an NFL game at quarterback. NC State, with a program arguably on the same level historically as those schools, is QBU by comparison, with three alums (so far) making an impact on the NFL scene at the quarterback position. Roman Gabriel was the first. Gabriel, a member of the College Football Hall of Fame, was the second overall pick in the NFL draft in 1962. He played for 16 years in the league with the Rams and Eagles, winning the NFL MVP award in 1969. Gabriel was in a movie with John Wayne; he also portrayed a headhunter on Gilligan’s Island. Erik Kramer’s NFL career wasn’t quite as distinguished as Gabriel’s, but in ten seasons Kramer did make 67 starts. His claims to fame include an appearance on Married with Children (as himself). Most notable, however, is the fact that Kramer is the only man alive to have quarterbacked the Detroit Lions to victory in a playoff game. Philip Rivers is a known quantity to current football fans. By the time the month of October rolls around, he will have started 100 games in the NFL and thrown for over 25,000 yards. Unlike Gabriel and Kramer, Rivers has yet to make an appearance in a network sitcom. Russell Wilson may not be as well known as Rivers yet, but odds are he will be sooner rather than later; he has already made his first commercial. Russell was the Pack’s starting QB for three seasons before spending his final year as a transfer grad student at Wisconsin (leading the Badgers to the Rose Bowl). He won the starting QB job for the Seattle Seahawks this year as a rookie despite only being a third-round pick. Wilson’s move to Madison was a controversial one, and could have backfired on NC State head coach Tom O’Brien. It didn’t, though, largely because O’Brien had another potential NFL quarterback in Mike Glennon waiting in the wings. Glennon wasn’t a sure bet this time last year, however, and so O’Brien was the subject of a lot of criticism. Criticism of O’Brien isn’t exactly a new concept. O’Brien has always had a particular kind of rap against him, that of being a decent coach with a definite ceiling. At Boston College, he took over a program racked by scandal and patiently built it into a perennial bowl team, consistently winning eight or nine games every season. After a while, though, BC fans began to tire of never winning “the big one” and playing in middling bowl games (which O’Brien usually won; he is 8-2 in bowls). O’Brien also apparently didn’t get along with his AD, and so he wound up taking the NC State job. The school needed an experienced, steady disciplinarian (O’Brien went to the U.S. Naval Academy and served in the Marine Corps). O’Brien had a slower start in terms of wins and losses at North Carolina State, but in the last two years the team has won nine and eight games, respectively. Of course, it wasn’t quite that simple last year, as not only had Wilson departed, but due to scheduling two FCS teams, the Pack had to win seven regular season games to qualify for a bowl. A befuddling loss to O’Brien’s old team, Boston College, meant that NC State had to win its last two games to get to seven victories, and one of those was against eventual ACC champ Clemson — but the ever-erratic Pack smashed the Tigers, 37-13. Then in the season finale against two-win Maryland, NC State trailed 41-14 in the third quarter before scoring 42 straight points to win the game and a berth in the Belk Bowl (slacks for everybody!). Fans of NC State are unsure if the Pack can win a title with Tom O’Brien as a coach. He is not known for recruiting at a championship level, he isn’t an offensive innovator, and there is nothing in his history that suggests he can take the program to the “next level”. On the other hand, he wins more than he loses, he runs a relatively tight ship, and he knows how to beat UNC (5-0 against the Heels). Maybe one year, a few more breaks will go his way, and NC State will wind up in the Orange Bowl. O’Brien has also inspired TOBing, easily one of the great college football memes of this century, good enough to be the subject of newspaper articles. It has been mentioned by ESPN and NC State’s own game notes. The TOBing craze was instigated by longtime blogger Akula Wolf of Backing the Pack. The coach has a couple of Low Country connections. His youngest daughter works for the Historic Charleston Foundation. O’Brien is also one of the 1,989 college football and basketball coaches who owns a vacation home along the South Carolina coast. When Russell Wilson transferred to Wisconsin, that put the onus on Mike Glennon to deliver an all-star type of season. He did just that in 2011, completing 62.5% of his passes for 3,054 yards and 31 TDs. In his last four games, Glennon threw for over 1,000 yards and 11 touchdowns. The 6’6″ Glennon struggled in this year’s opener against Tennessee, throwing four interceptions, but has been pick-free in two wins over Connecticut and South Alabama. He threw three TD passes against the Jaguars. While Glennon is established as the snap-taker, that same sense of stability cannot be found at running back for NC State. Irmo High grad Mustafa Greene will not play against The Citadel, as he has been suspended. James Washington and Tony Creecy should get the bulk of the carries. Washington is the last NCSU player to rush for 100 yards in a game; he did so against North Carolina last season. NC State is averaging 2.6 yards per rush through three games, a number that includes lost yardage from sacks, but is still not very good. The Pack has not had a player rush for over 1,000 yards since 2002. Part of not having a 1,000-yard back can probably be attributed to offensive line play, which has been a sore subject for Pack supporters during the O’Brien era. The coach has not been able to consistently develop the kind of quality o-line talent in Raleigh that he had in Chestnut Hill. This season a couple of regulars were shifted around (“new” starting left guard R.J. Mattes has now played in four different spots on the o-line in his career). NC State is already on its second left tackle of the campaign after Rob Crisp was injured against Tennessee. Several receivers are capable of making big plays for the Pack. Bryan Underwood has two TD receptions this year of more than 40 yards. Quintin Payton is a 6’4″ wideout who is averaging almost 20 yards per reception; he had 129 receiving yards versus Tennessee. Tobais Palmer had five TD catches in 2011. 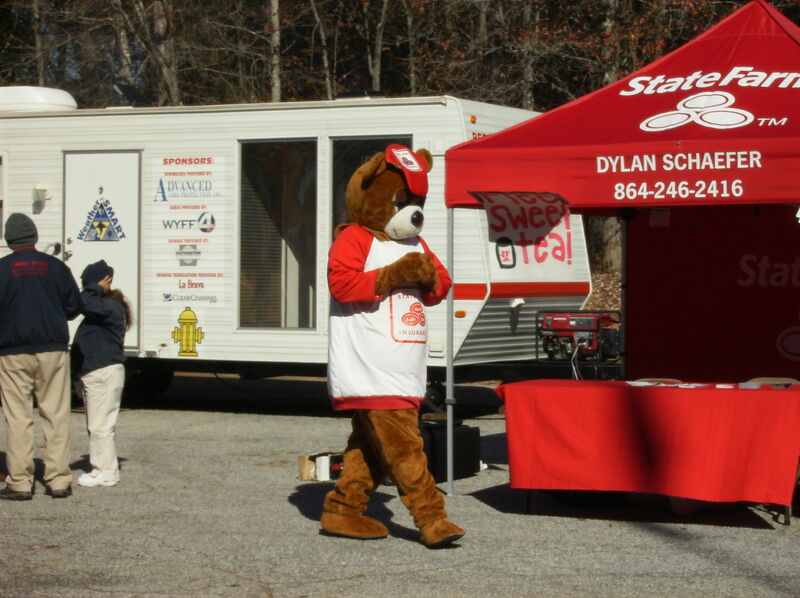 He is also NC State’s primary kick returner. 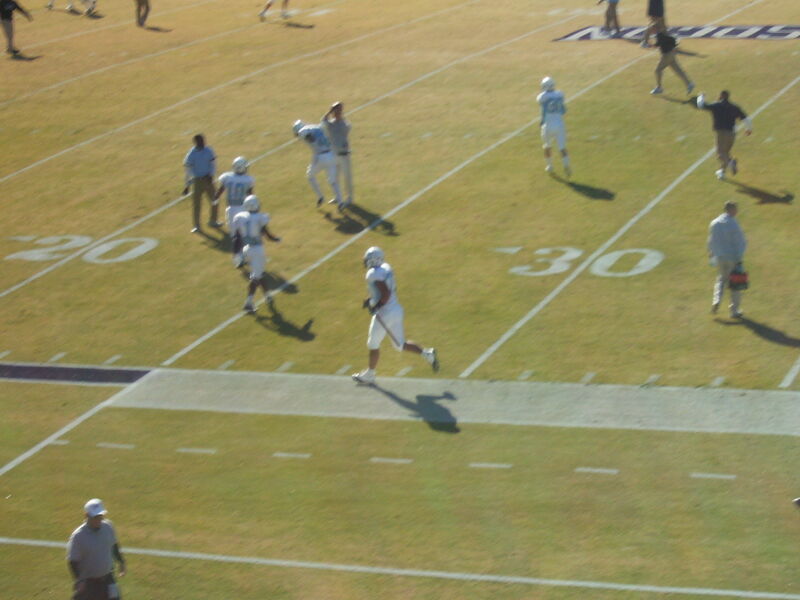 Another receiver, Rashard Smith (who caught a touchdown pass against South Alabama), returns punts. Mike Glennon will also occasionally throw to his tight ends. Actually, Glennon will throw to just about anybody, as he has already completed passes to twelve different players this season through just three games. NCSU’s strength on defense lies in its secondary, which has talent and experience. All-American David Amerson is an amazing ball-hawk; he intercepted 13 (!) passes last season and already has two picks this year. He got burned a couple of times against Tennessee, but that can happen to the best of DBs. Amerson is joined in the defensive backfield by safeties Earl Wolff (such a good name for an NC State player) and Brandon Bishop, who have combined to start 69 games for the Pack. The two aren’t afraid to mix it up, either, as they have accounted for a combined 54 tackles through three games this season. Incidentally, Wolff’s mother is currently serving overseas in the military. North Carolina State’s linebacking corps is not nearly as experienced. Middle linebacker Sterling Lucas is back after missing the 2011 season due to injury. Lucas is easily the best-educated of all the Pack players, although he has yet to inform the school’s athletic media relations department that it has the name of his high school listed improperly in the game notes. NCSU has a couple of promising younger players in sophomores Rodman Noel (whose younger brother, Nerlens Noel, is a super-hyped freshman basketball player at Kentucky this year) and Brandon Pittman. Noel will start in the Pack’s base 4-3, but Pittman will play a lot. On the defensive line, NCSU will rotate up to ten guys. The key players in this unit on Saturday might be veteran right end Brian Slay and 315-lb. DT Thomas Teal. Over the last two games NCSU has held its opponents to a meager 2-for-23 on third down conversion attempts, with South Alabama pulling an 0-fer in the category (in eleven tries). Tennessee was 9-for-19 converting third downs against the Pack. Both of NC State’s kicking specialists started as freshmen last year. 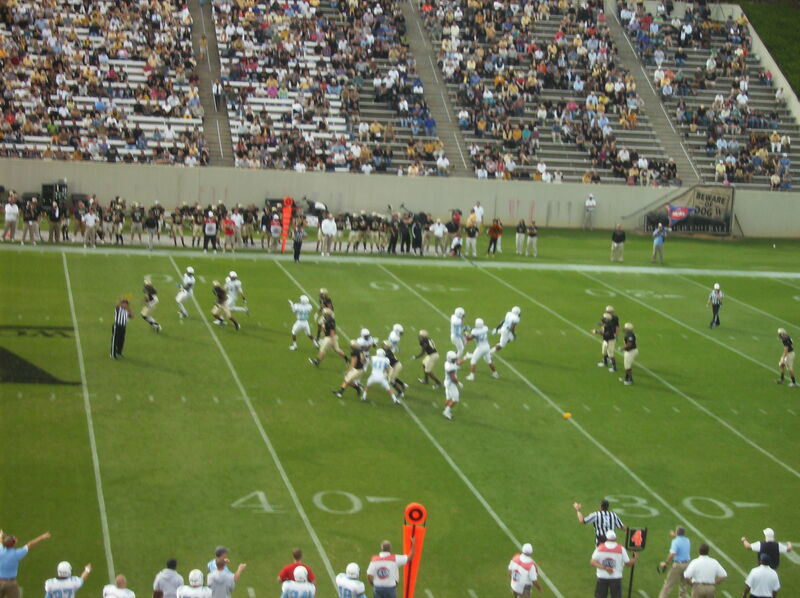 Niklas Sade is the Pack’s placekicker. He has made 50 consecutive PATs and was 11-16 on FG attempts last year, although so far this season Sade is only 2-5. His career long is 45 yards. Wil Baumann is NC State’s punter. From what I can tell, based on the stats, he is more of a directional kicker than a true “boomer”. This could be a tough week for fans of the Domonic Jones Puntblocking Experience (DJPE), however, as NC State hasn’t had a punt blocked in over three seasons, and hasn’t had one blocked and returned for a TD since 2005. For the third consecutive week, The Citadel will play in a game designated as Military Appreciation Day. NC State has an impressive history of producing military officers, and I would anticipate a particularly good show at Carter-Finley. It is hard to really predict how Saturday’s game will go. The Citadel was very competitive in its last matchup against an FBS opponent, and that was against a nationally ranked South Carolina squad at the close of last season. On the other hand, it is also true that the Gamecocks did not punt in that game. I don’t think this NC State team is as good as that South Carolina outfit (at the very least, there will be no Alshon Jeffery with which to contend), but the Pack is a solid ACC program that features a fine quarterback and several playmakers. By my count, Tom O’Brien is 10-0 against I-AA/FCS schools in his head coaching career. One of those wins came in 2007 against Wofford, in O’Brien’s first season in Raleigh. NC State won that game 38-17, a good approximation of what the smart money says Saturday’s result will be. NC State has played Georgia Tech in each of the last two years, so it is not unfamiliar with the triple option. 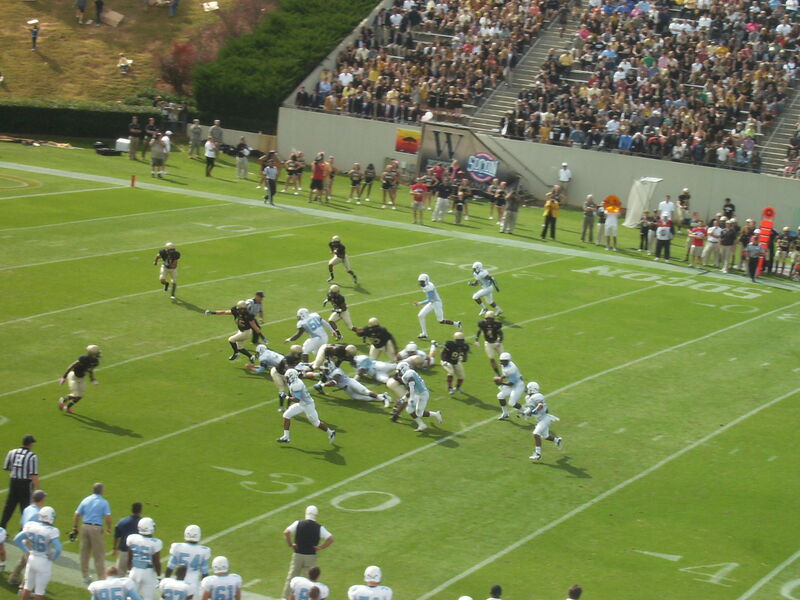 The Pack did not always defend the Jackets’ offense very well in those games, but then Georgia Tech has a different level of athlete in its system than does (for the most part) The Citadel. At any rate, NCSU was already preparing for this game before the season began. Much of the focus for this week’s contest has been on how NC State will defend Triple O’Higgins, but it may be that The Citadel’s biggest task will be for its defense to stop a potent (if occasionally inconsistent) Pack offense. In most FBS vs. FCS contests, the main advantage the FBS school has is on the line of scrimmage. How the Bulldogs solve that problem will go a long way to determining how close the game will be. To me, this game is a freeroll for the Bulldogs. A loss doesn’t affect any of the team’s long-term goals in any way, except for having a winning season, and even there The Citadel will have plenty of opportunities to get three more victories. What is important is that The Citadel comes out of this game with A) no serious injuries, B) confidence intact, and C) a cashed check for $375K. Ben Dupree was asked if a win over NC State would “validate” the program. He correctly said no. To beat an FBS team, you have to be on your ‘A’ game. I don’t think winning this game would validate us, but it would get us some more national attention. We’re hoping to win this game and be a top 5 team. In a bit of an oddity, The Citadel could be the team on Saturday night in danger of suffering a letdown. I hope that doesn’t happen, but it wouldn’t be a big surprise for the Bulldogs to come out flat after two enormous (and potentially program-altering) wins. That said, the bandwagon is starting to fill up. A win in Raleigh would fill it to near capacity. 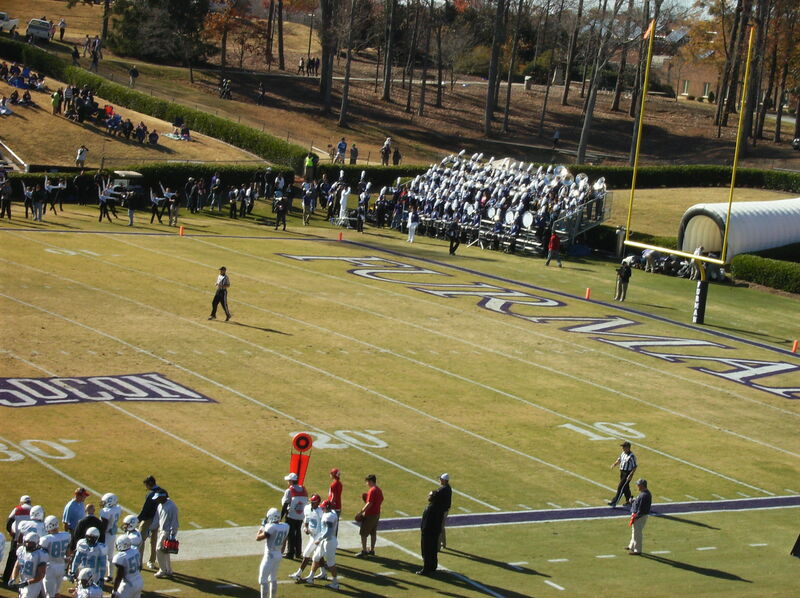 The Citadel at Western Carolina, to be played at E.J. 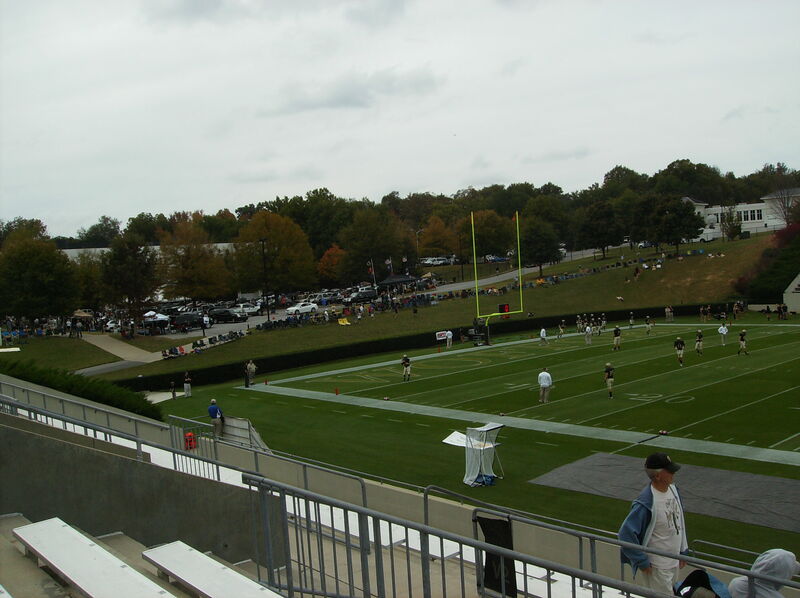 Whitmire Stadium, with kickoff at 3:00 pm ET on Saturday, October 22. The game will not be televised. The game can be heard on radio via The Citadel Sports Network, with “Voice of the Bulldogs” Danny Reed calling the action alongside analyst Walt Nadzak. Bulldog Insider will also provide free audio; the only video available for this game is being provided by Western Carolina as part of a subscription service. 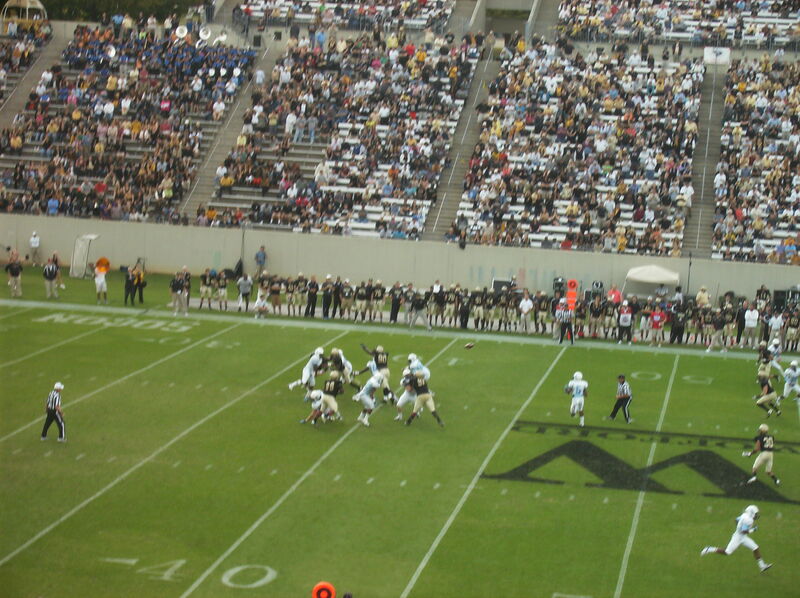 As it happens, I did not attend the App State game, nor did I listen to it on the radio. Without going into specifics, Saturday was a difficult day for me. 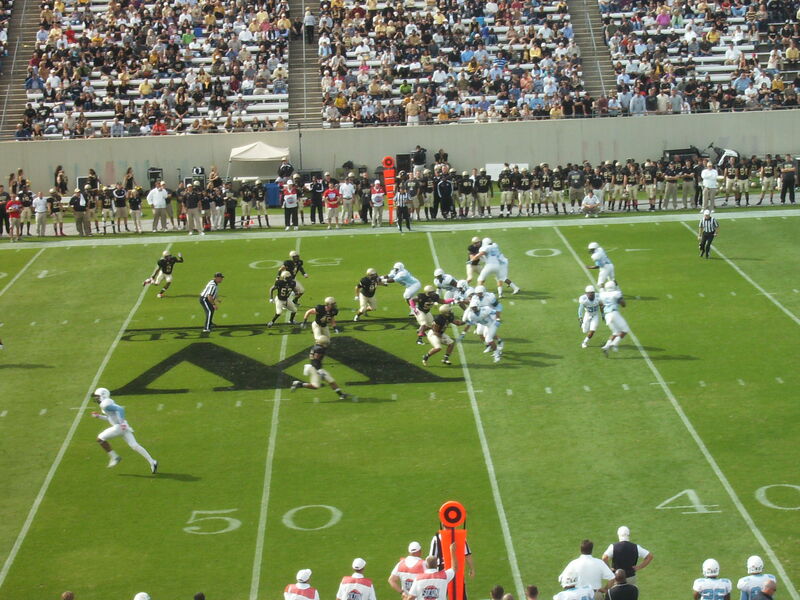 In lieu of an extensive review of the 49-42 loss to the Mountaineers, I want to make a general point about access to athletics at The Citadel. It’s really amazing how far we’ve come in the information age, isn’t it? I didn’t get to watch the game on Saturday, but I can see the highlights on my computer (via The Kevin Higgins Show). I can go online and read about how the game went from a number of different sources, whether it is the established press (like Jeff Hartsell of The Post and Courier) or the releases from both participating schools (plus the SoCon). I can pull up the game statistics on that same school website, and I can even get fan reaction from a message board. Of course, in normal circumstances, if I had not been able to see the game in person I could have listened to Danny Reed call the game. The Citadel has always had a small radio network, but now you can follow the radio play-by-play online as well, and for home games you can watch a video feed (for a not-unreasonable fee). The access to information is particularly welcome for a small school like The Citadel. It used to be hard to follow the program from anywhere outside of the Charleston metro area. Now people all over the world have the opportunity to get at least a taste of the action. I know I don’t take it for granted. I just wish all this had come about sooner. Tangent: I do have one request, if anyone knows somebody in the athletic media relations office. When The Citadel switched to a new provider for its website, some things got lost in the shuffle, including the statistics for previous years. 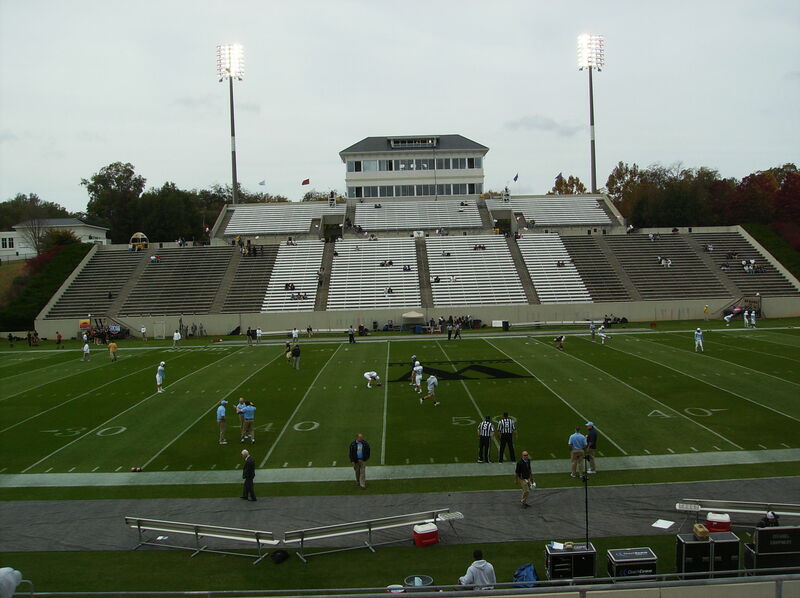 For example, when I was trying to figure out how many penalties Wofford had committed against The Citadel in recent seasons, I wound up having to get the information from Wofford’s website. I know it’s not a big deal, but it would be nice if all of those compiled stats could be uploaded again. You never know when some dweeb will want to look up pitch counts from 2003. 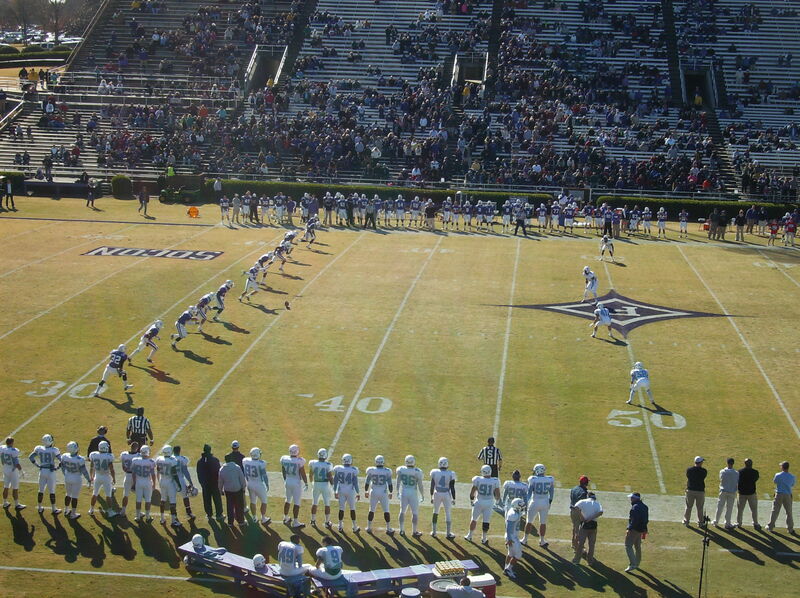 — The Bulldogs went with the all-navy look on Saturday. It’s the fourth time The Citadel has sported that combo. 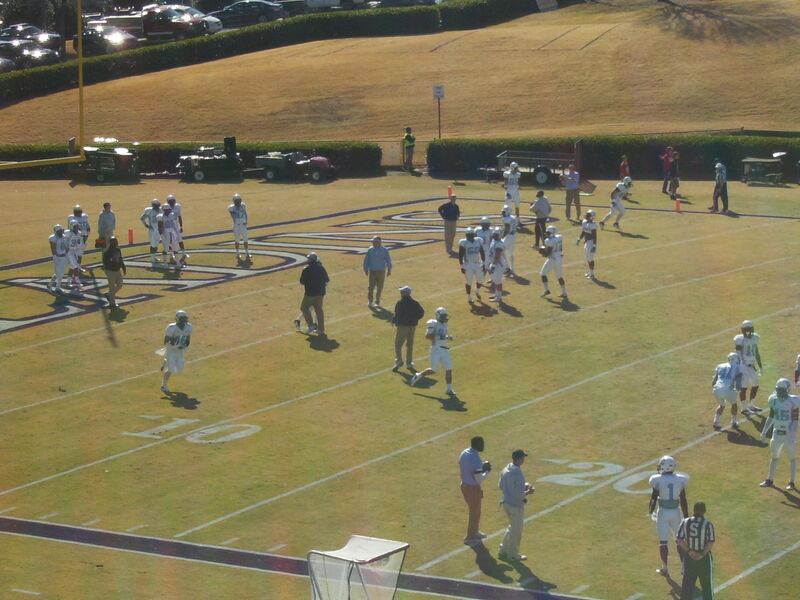 In those four games, the Bulldogs are 1-3, 0-3 in SoCon play. 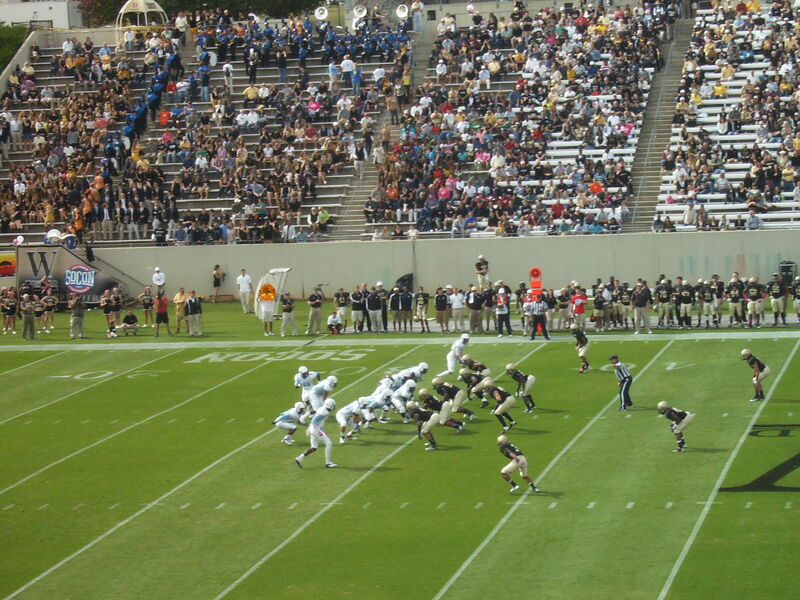 The Citadel has allowed a total of 100 points in those three league defeats. 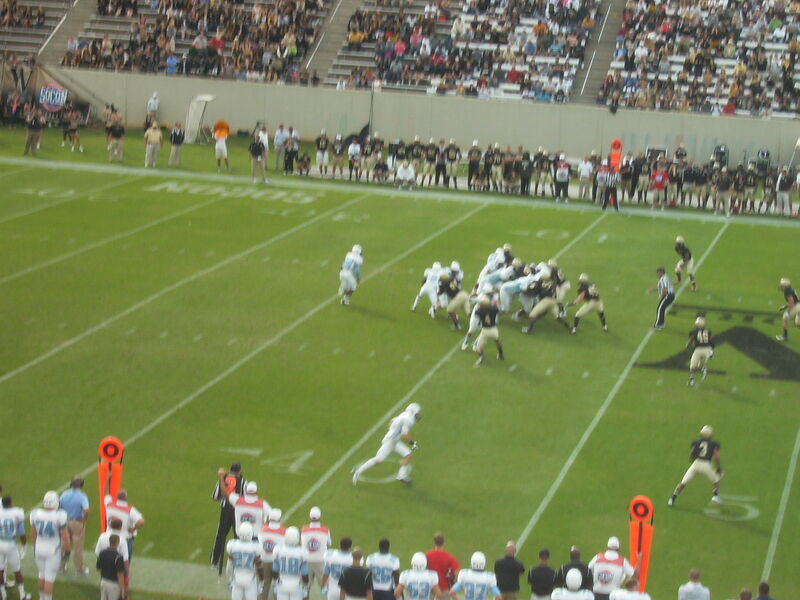 — The Citadel finally scored in the first quarter of a game. It did take a drive sustained by a fake punt to accomplish that, but the points still count. Speaking of the fake punt, that was well-executed. I don’t remember seeing one quite like it before, with Cass Couey actually getting the snap and then making an underhand shovel to Kevin Hardy. Statistically, it was a running play. I think you could make an argument that it was a pass attempt. I guess it comes down to the definition/interpretation of what constitutes a forward pass. — By this point, if teams don’t know Luke Caldwell is looking to throw the ball on the end-around, they need to fire their video coordinators. — Domonic Jones has four punt blocks this season, although I think the one against the Mountaineers was his first “stuff” job, as I seem to recall the previous three being tips rather than complete blocks. I could be wrong about that. At any rate, he did a great job of not only blocking the punt, but recovering very quickly to get up and run it in for the TD. I could not quite make out on the video the Bulldog (Chris Billinglea?) who essentially occupied the entire App State protection unit; whoever it was, well done. 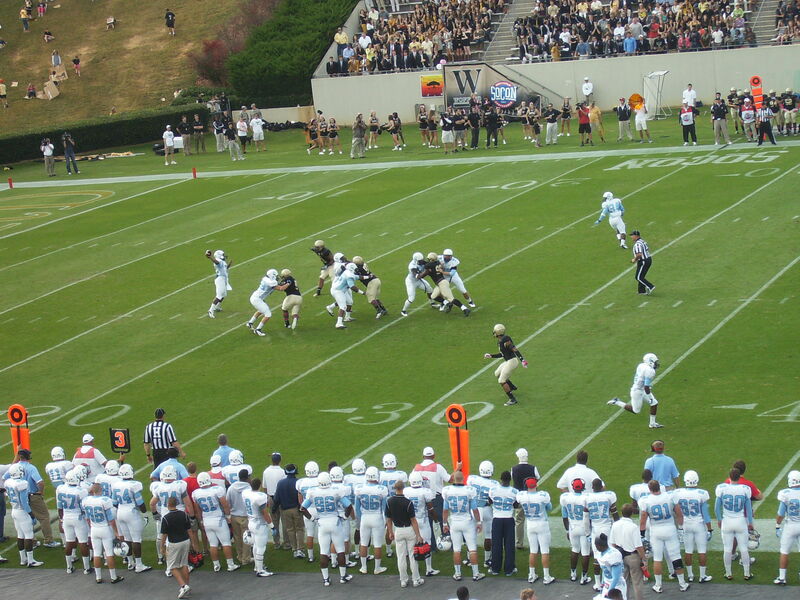 I’m enjoying this new era of The Citadel blocking punts on a semi-regular basis. Now the Bulldogs just need to force more punts. 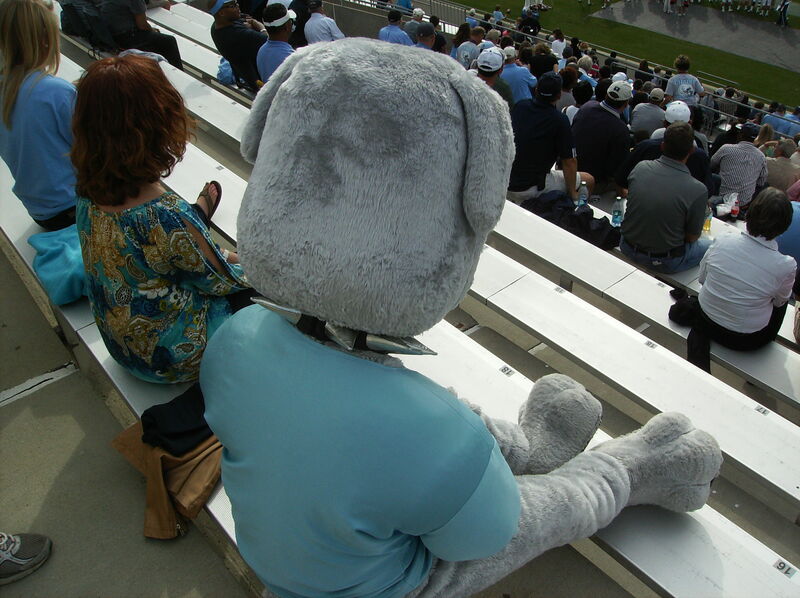 The Citadel plays Western Carolina this Saturday, in Cullowhee. Let’s be clear about this. It doesn’t matter that it’s a road game. It doesn’t matter that the team is still going through triple option growing pains. It doesn’t matter there is uncertainty surrounding the quarterback position. It doesn’t matter that the defense has lost its mojo over the last two games and needs to regain its confidence. 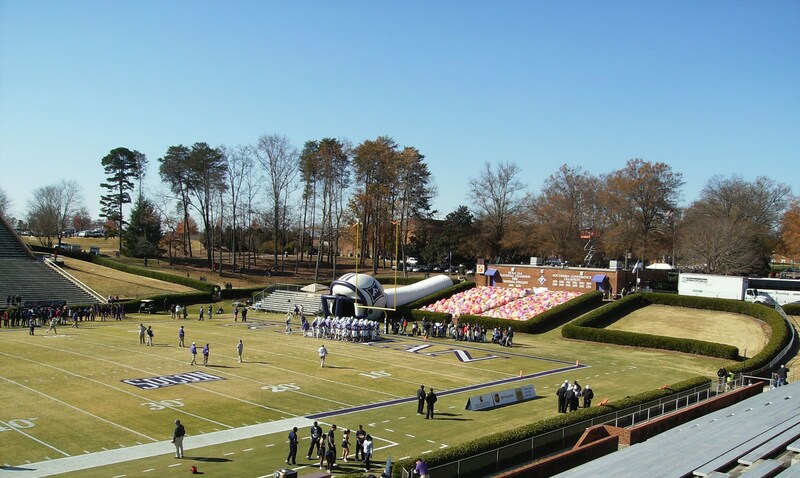 Since the final game of the 2005 season, Western Carolina has played 43 Southern Conference games. The Catamounts have lost 40 of them. Only three times has WCU tasted victory. One of those games came in 2008 against a Chattanooga squad that went 1-11. 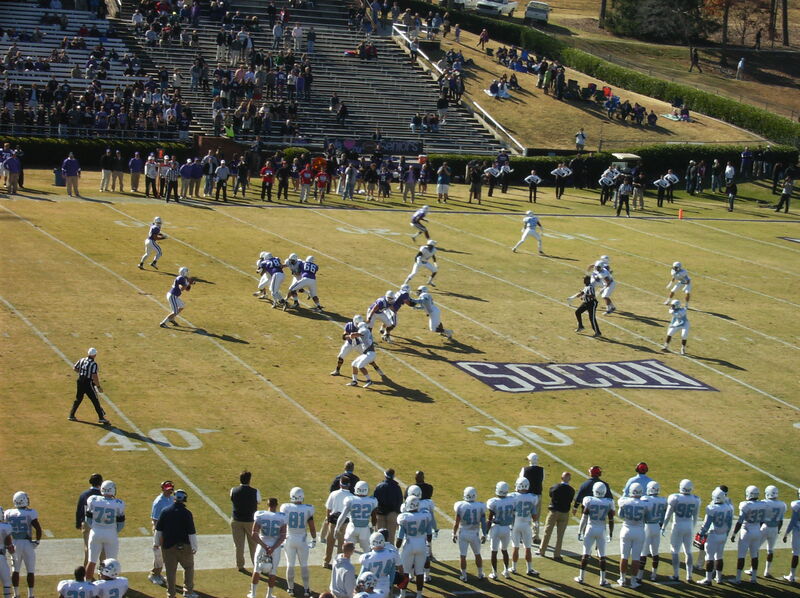 The other two wins came in Western Carolina’s last two meetings against The Citadel. The Bulldogs may face a team that is struggling and/or lacks (as a program) certain resources. 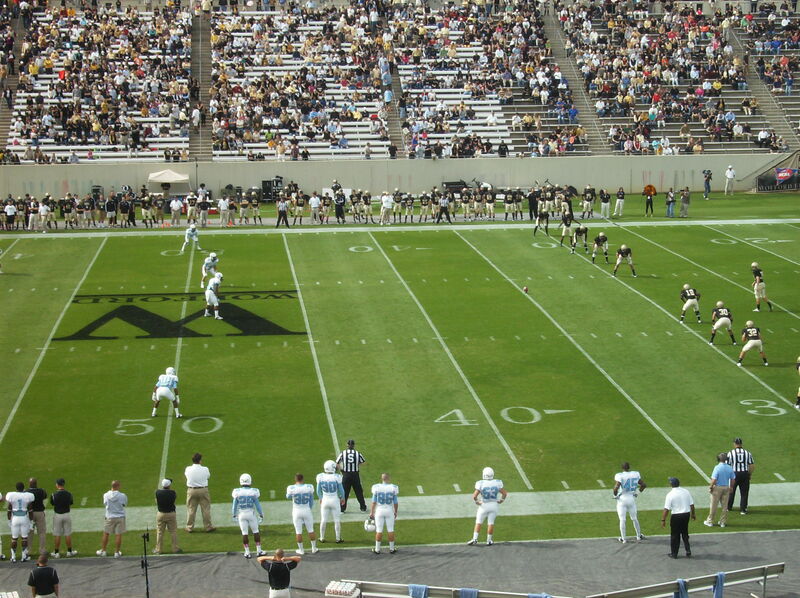 However, The Citadel will never be in a position to just show up and win while playing its “C” game. The military school doesn’t have the capacity to do that, and never will, because of its own restrictions (note that I said restrictions, not disadvantages). At its best as a program, The Citadel could beat any league team — and could lose to any league team. That’s just the way it is. In terms of physical talent, no other conference squad will ever be overmatched by the Bulldogs. Last season, the Bulldogs came out flat and lost to a struggling team that was giving a true freshman quarterback (Brandon Pechloff) his first career start. 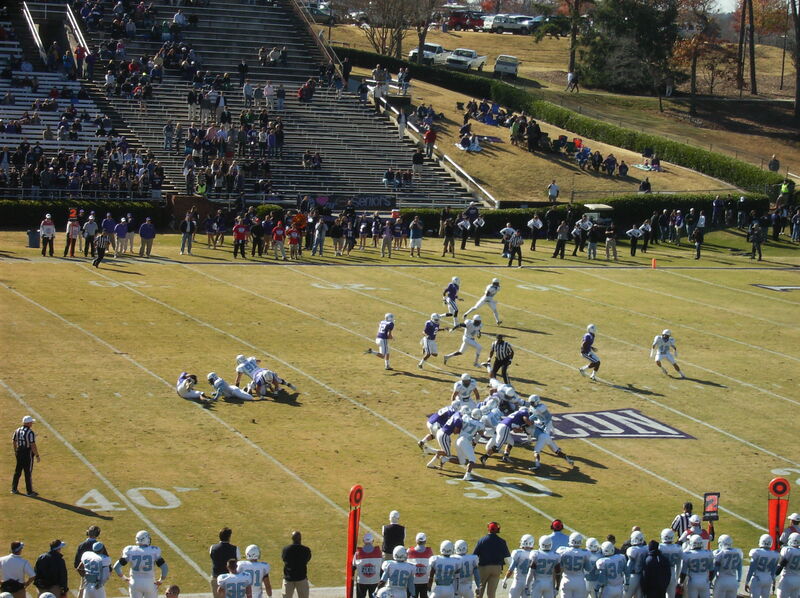 The year before, The Citadel lost to a WCU team that could barely get out of its own way. That’s why it is paramount that the Bulldogs start strong on Saturday. Don’t allow a downtrodden team hope — and when I say downtrodden, it is not an exaggeration. When a coach feels compelled to write an open letter to fans after a 44-point home loss, you know there is a problem. 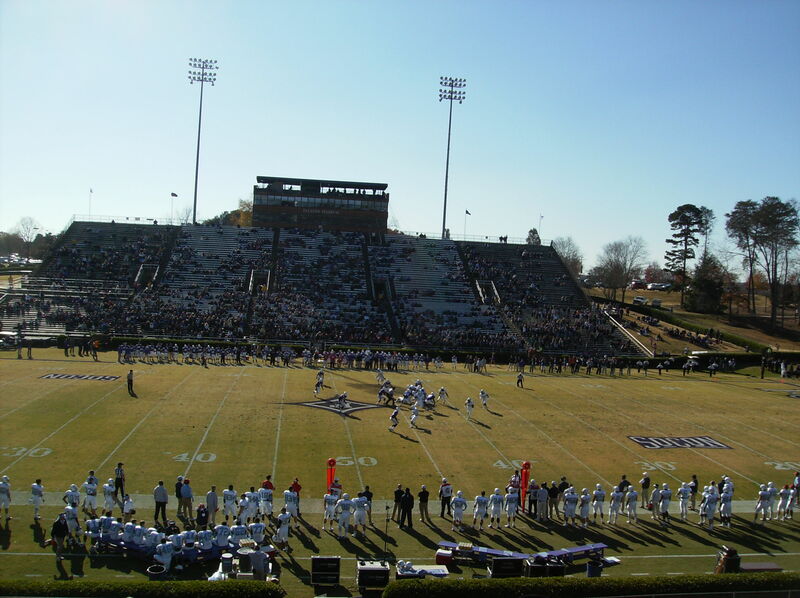 Western Carolina ranks last in the following SoCon statistical categories: scoring defense, rush defense (allowing 319 yards per game — ouch), pass defense efficiency, total defense (shocker), defensive interceptions, sacks against the offense, sacks by the defense, penalties, time of possession, opponents’ third-down conversion rate, and opponents’ first downs. 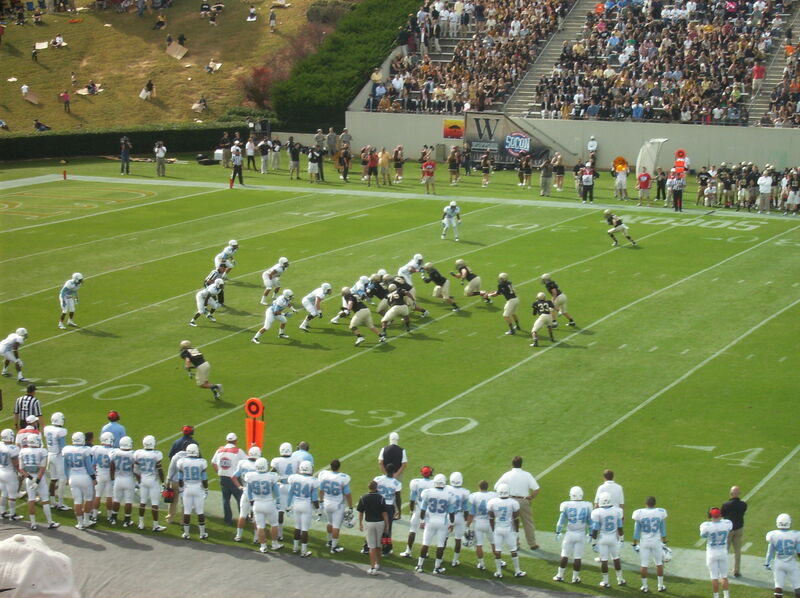 The Catamounts do lead the league, curiously, in drawing penalties by their opponents. I guess blowouts can get a little sloppy. The Citadel needs to stay disciplined on Saturday and maintain its status as the league’s least-penalized team. 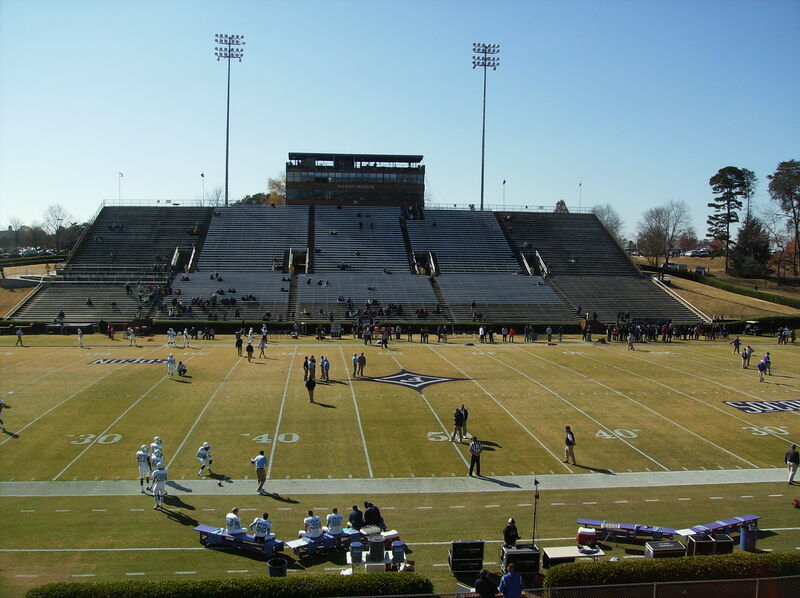 In all fairness to Western Carolina, a lot of defenses would have less-than-stellar numbers against the rush after playing Georgia Tech and Georgia Southern. 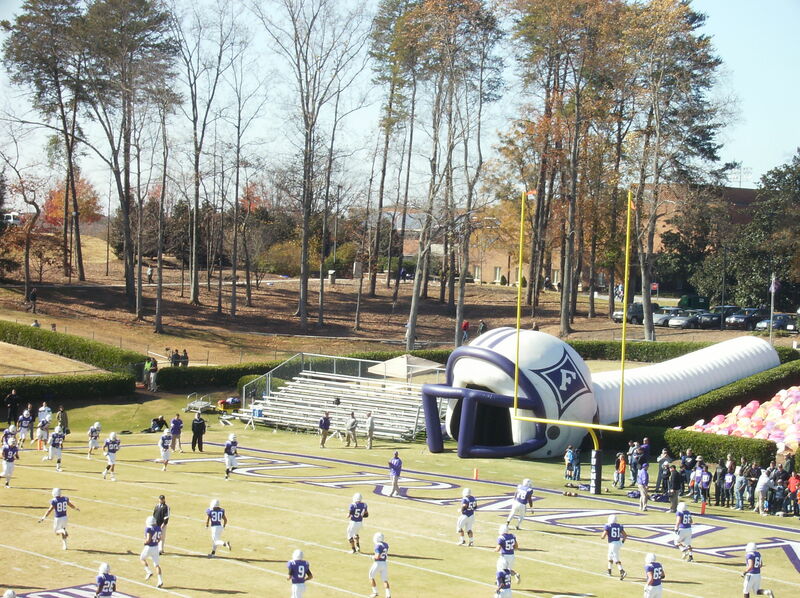 On the other hand, Furman rolled up 268 rushing yards in a 47-point outburst against the Catamounts. Elon scored 38 (in a 38-31 game in Cullowhee that was WCU’s best SoCon performance to date). 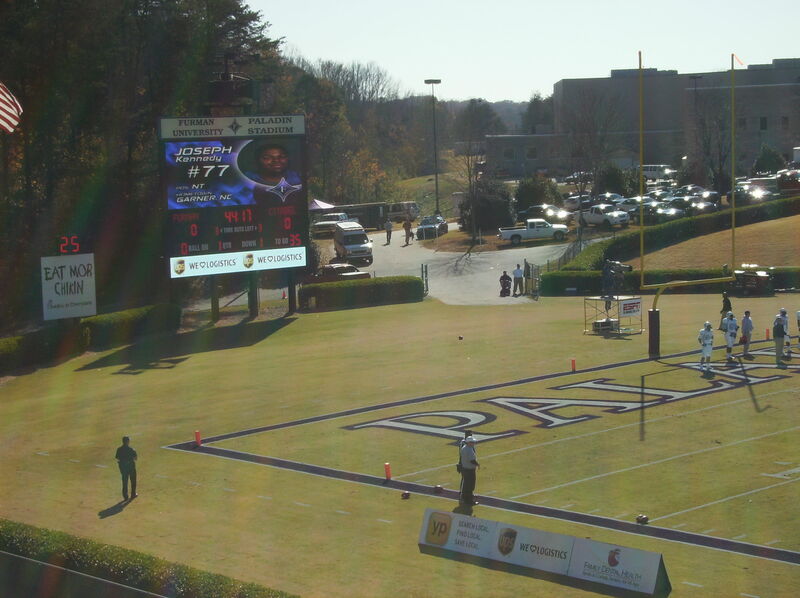 Even in Western Carolina’s lone victory, Mars Hill scored 31 points. Pechloff, a 6’7″ left-hander, is a good passer when he has time to throw the ball. The Bulldogs need to rush him effectively and often in this game, as besides being a sack target Pechloff is turnover-prone (including nine interceptions this season). That largely explains why the Catamounts are second in the league in passing yardage per game but next-to-last in offensive pass efficiency (ahead of only, you guessed it, The Citadel). His main aerial target is Josh Cockrell, who had two TD catches against both Elon and Furman (he added a rushing TD against the Phoenix). Cockrell only caught one pass against The Citadel last season, but I still remember it. I have rarely been as frustrated by a 20-yard catch in my life, as an under-duress Pechloff floated a pass that just sat in the air for seemingly days before settling into the arms of Cockrell. It summed up the whole game. Western Carolina is not a strong running team, ranking seventh in the league in rush offense. 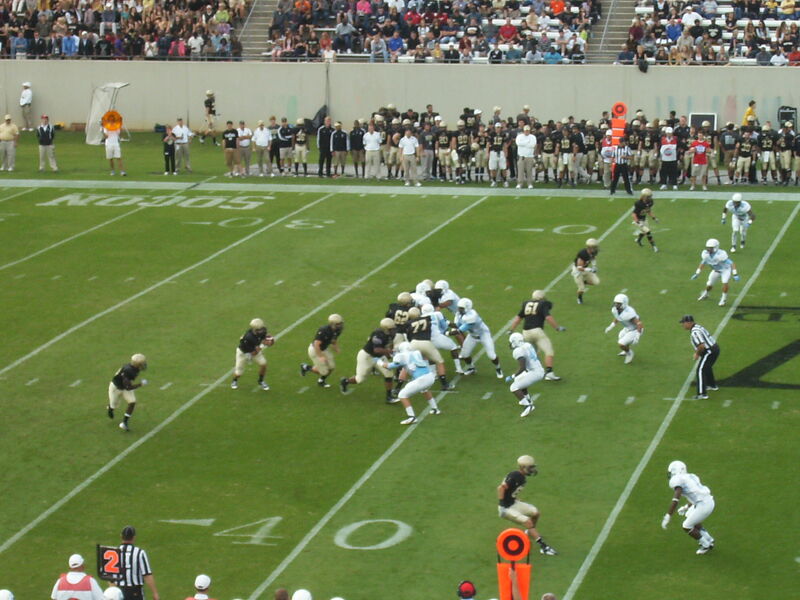 The Catamounts average just 3.8 yards per carry. In an effort to avoid yet another slow start, Kevin Higgins is considering an old Bo Schembechler move to get the team ready for battle. Schembechler, Fritz Crisler, Fielding Yost…it doesn’t matter which ex-Michigan coach had the idea. As long as it works, I’m fine with it. I’m also okay with Higgins’ decision (as noted in the above link) to start Ben Dupree at quarterback, at least for one more game (though I understand the argument for making a switch). I think the coach’s reasons for sticking with Dupree are solid. Besides, if Aaron Miller winds up getting close to twice as many snaps (as he did against Appalachian State), it’s not that big a deal anyway. Both of them will play. The one who is more effective at the controls of Triple O’Higgins will play more. I won’t be in Cullowhee on Saturday, but I’ll be following the action. I want to hear the phrase “fire those cannons” early and often. This game needs to be an Al Davis (RIP) special. Just win, baby. 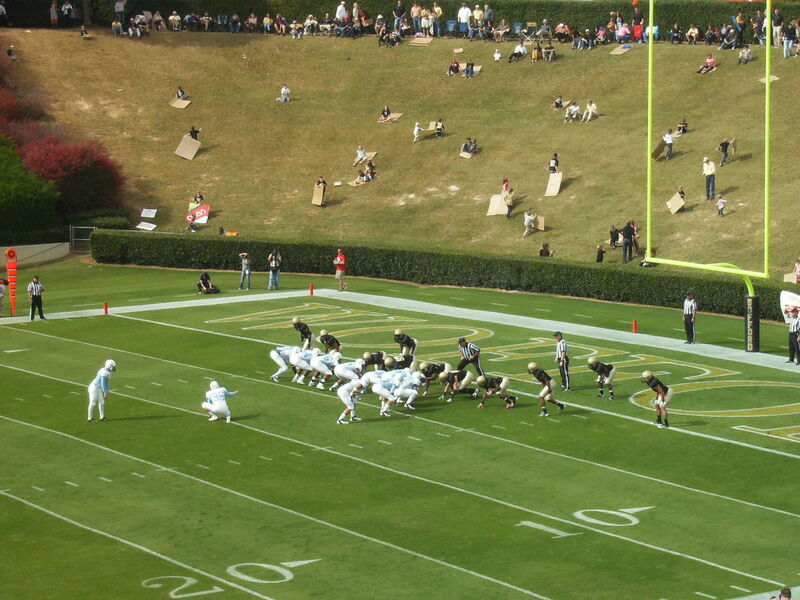 The Citadel at Chattanooga, to be played at Finley Stadium, with kickoff at 6:05 pm ET on Saturday, October 1. The game will not be televised. The game can be heard on radio via The Citadel Sports Network, with “Voice of the Bulldogs” Danny Reed calling the action alongside analyst Walt Nadzak. Bulldog Insider will also provide free audio; the only video available for this game is being provided by Chattanooga as part of a subscription service. This post will serve as a combination review of the Elon game and preview of the Chattanooga contest. I’m combining them because A) I’ve been a little busy, and B) I’m not sure I have enough to say about the two games to justify separate posts. I’ll have to do the same thing next week, because I definitely won’t have the chance to write a review of the UTC game, as I will be travelling. I won’t even be able to listen to Danny Reed and Walt Nadzak call the game on the radio. 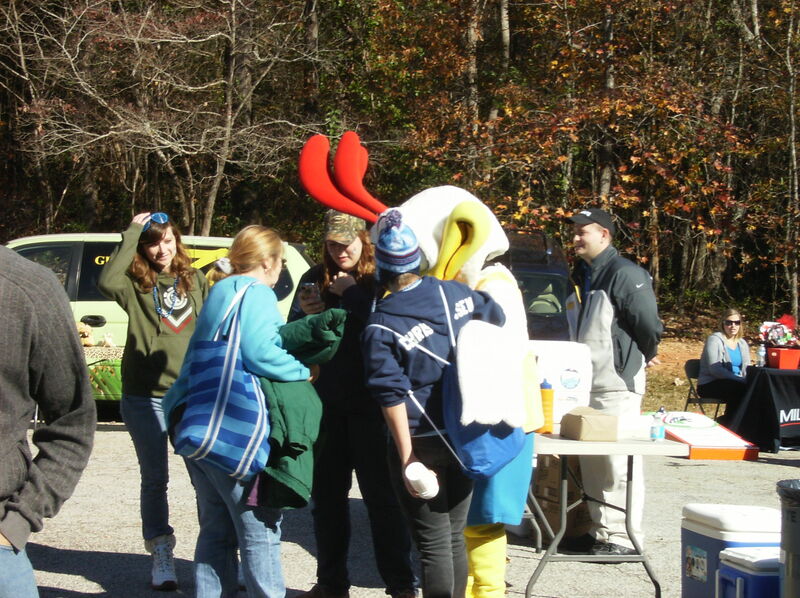 That’s what I did for the Elon game, as I had another obligation. As a result I found myself listening to Reed and Nadzak as I drove through a series of thunderstorms (one would pop up about every five minutes; it was ridiculous) while trying to navigate I-26 on a football Saturday. Between the rain and the Gamecock fans heading to Columbia (some of whom drove about as well as Stephen Garcia threw the ball that night), it was a bit of an adventure. I concentrated on Reed’s call, though, and he did a solid job informing his listeners about the game. 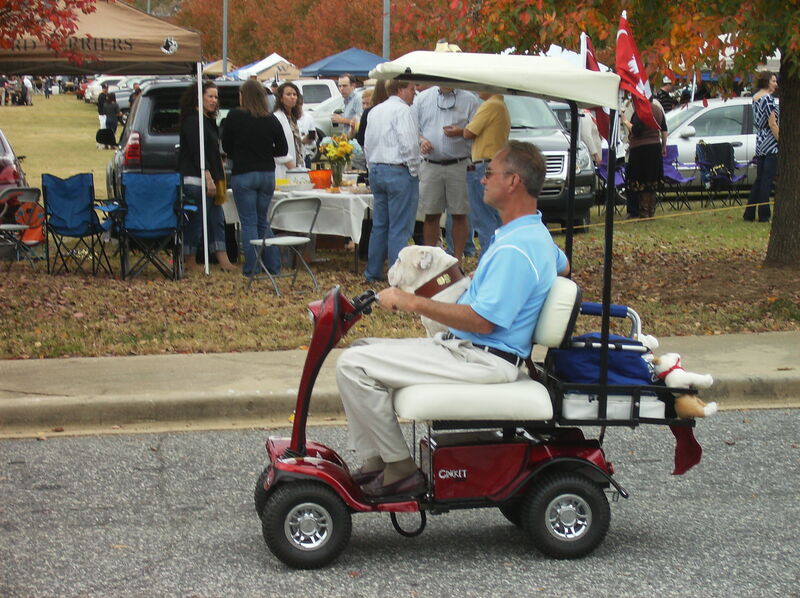 I also learned he likes to call running backs “sidecars”. I did go back and look at some of the game later, courtesy of Elon’s video recording, which came in handy. It helped flesh out some of the observations that follow, though it’s not the same thing as seeing the game “live”, either in person or via an internet stream. I want to talk about play-calling for a moment. Specifically, I’m going to write about two play calls in the first quarter. Now, I don’t pretend to be any kind of coach; as I have said numerous times before, I’m just a dude with a computer. It’s obviously not an easy task to coordinate an offense or defense, or call plays and formations. There was a good article on this subject in The Post and Courier last week that featured Clemson defensive coordinator Kevin Steele. It was quite illuminating (I have to say part of Steele’s routine struck me as overkill, but what do I know). 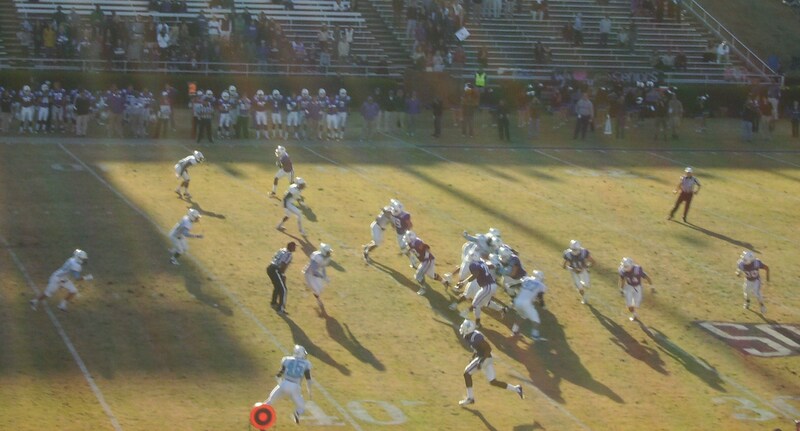 — On the first series of the game, the Bulldogs had second and eight from their own 31-yard line. 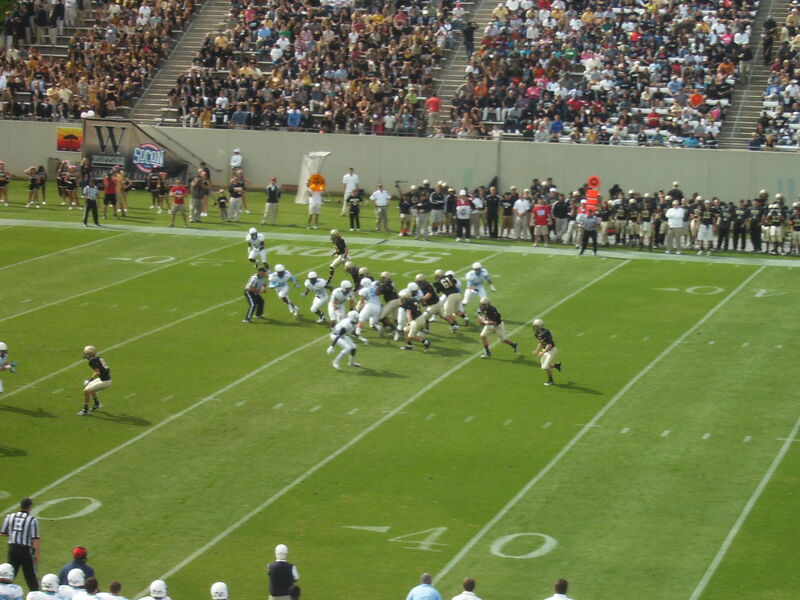 The Citadel ran an end-around receiver pass, with wideout Luke Caldwell’s toss to Kevin Hardy falling incomplete. 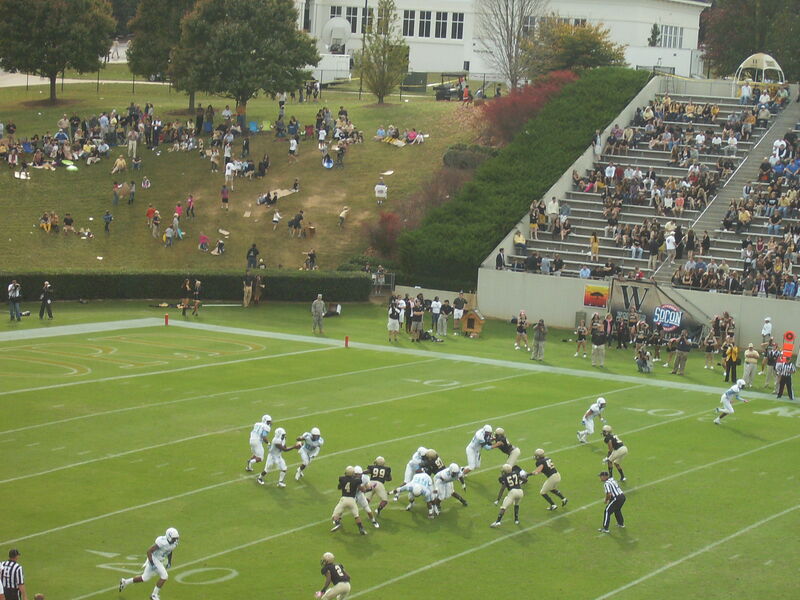 The play did not appear to fool the Elon defense. I’m not sure that’s a good play to run at the beginning of the game, when you’re trying to establish an offensive rhythm. Having said that, a variation of that play helped The Citadel win the game against Samford last year (and worked perfectly in one of the pre-season scrimmages). It didn’t matter much, because on the next play Ben Dupree reversed field and scampered for 36 yards, extending the drive. That would eventually lead to the play call that really bothered me. 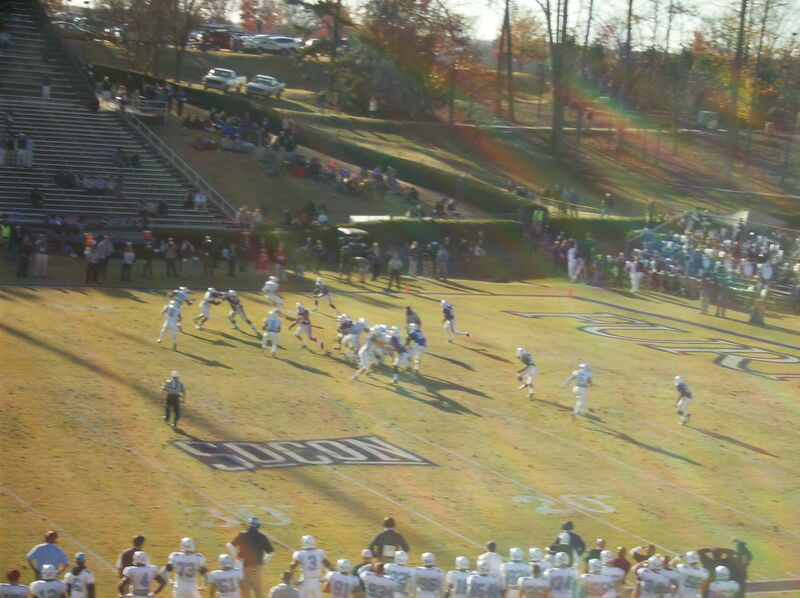 — The Bulldogs had third-and-goal on the Elon three-yard line. Dupree got the snap, took a quick drop, and threw a slant pass in the general direction of Domonic Jones. The pass was not accurate, but would not have been completed even if it had been. It was well defended. 1) The team is on the three-yard line, with two downs to score, running the triple option. Even if the Bulldogs don’t score on third down, the opportunity is there to go for it on 4th down if The Citadel picks up a yard or two. That’s what the offense is all about. 2) Okay, so the coaches want to mix things up with a pass — but why on third down? That’s the one down Elon might have expected a pass play. In that sequence, I think throwing the ball on first or second down is the better plan. 3) Also, the pass itself included no play-action. 4) Jones is 6’5″. Maybe a fade might have been a better idea than a slant. A lot of people probably concentrated on the short field goal that was missed following that play, but to me the real missed opportunity occurred one or two plays earlier. Speaking of the kicking game, I am on record as saying I don’t blame the kickers. 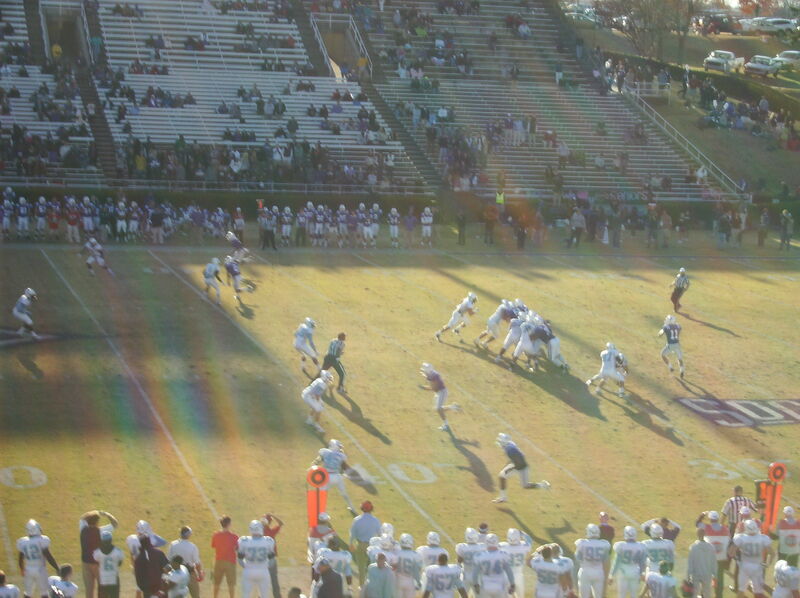 One thing that anyone following The Citadel knows is that the placekicking has been inconsistent for several years. That’s not about the kickers, the holders, or the snappers. That’s coaching. Either the players need to be coached better, or the coaches need to find better players. The missed field goals are frustrating, but almost as problematic is the kick return unit, which is averaging less than 20 yards per return. 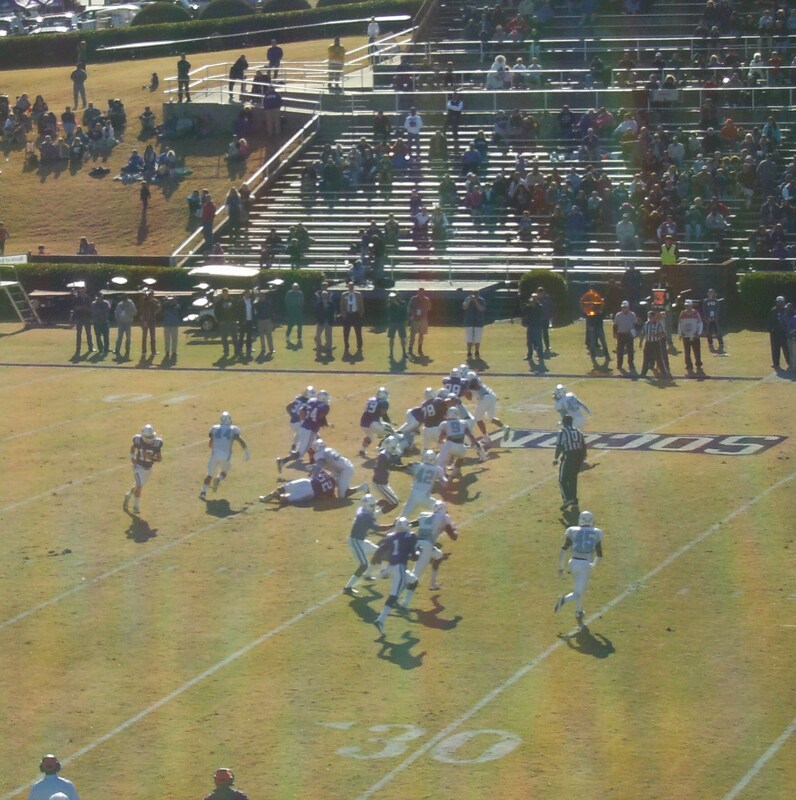 Against Elon, the Bulldogs started at their own 29-, 10-, 27-, and 30-yard lines after Phoenix kickoffs. That needs to improve. I thought Elon coach Jason Swepson inadvertently assisted The Citadel on Saturday with a couple of curious decisions. After an Aaron Mellette touchdown reception gave Elon a 12-7 lead with 12:55 remaining in the third quarter, Swepson elected to go for two points, despite the fact that almost 28 minutes remained in the game. The Phoenix didn’t make the conversion, which struck me as justice served, because nobody should start chasing points with so much time left in a game. 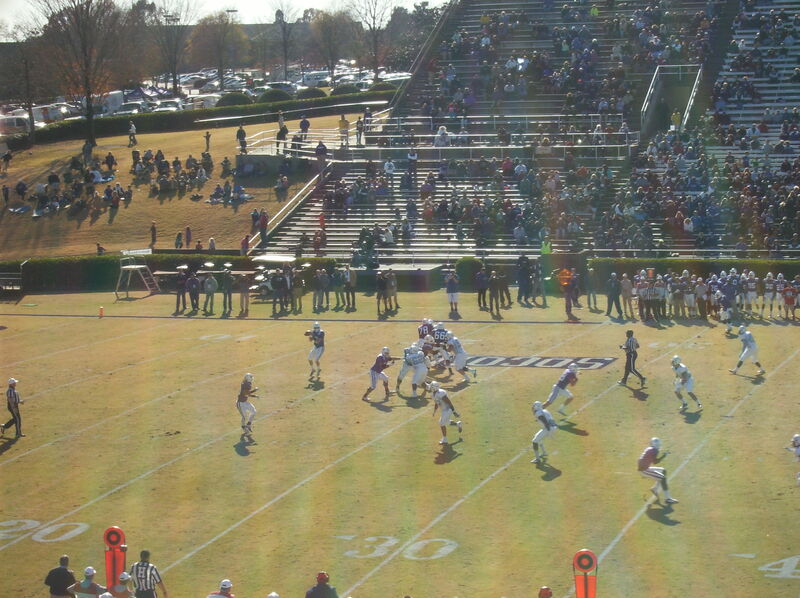 After a Bulldog fumble, Elon had the ball at The Citadel 38-yard line with 2:32 remaining in the fourth quarter. After a Phoenix first down moved the ball to the 27-yard line, Elon ran the ball (and the clock) to set up a 44-yard field goal attempt, which was missed. In my opinion, the Phoenix settled too quickly for the long FG try. 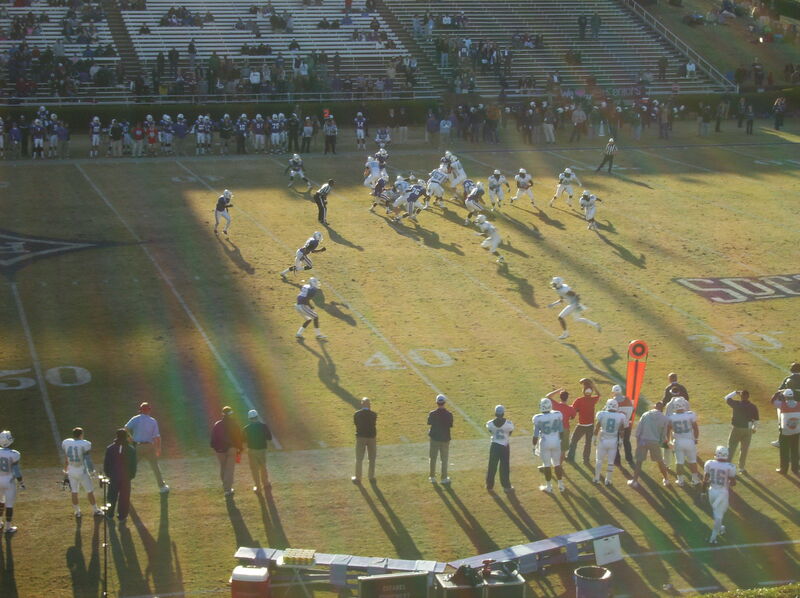 After The Citadel’s game notes indicated the Bulldogs were going to wear white jerseys and white pants against Elon, The Citadel broke out navy pants instead. The Bulldogs wore that combo once last season, versus Wofford. The Bulldogs lost that game 35-0. 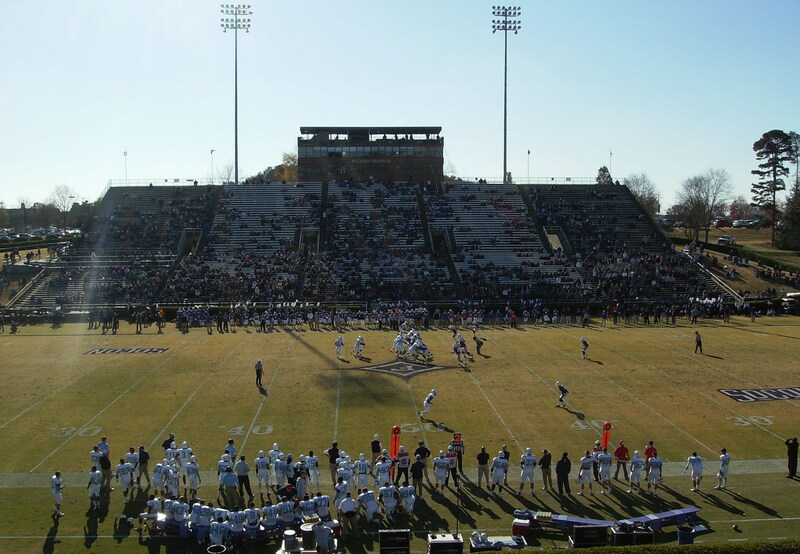 In the two white jerseys/navy pants games, five different Bulldog passers have combined to go 3-14 for 21 yards, and the team has averaged just 7.5 points per game, which is actually worse than the 9.7 ppg the team has averaged in the ten SoCon games played since installing the triple option. Well, Chattanooga didn’t drop the football program. Instead, the school hired alumnus Russ Huesman to coach the team, and that proved to be a very good decision. Huesman currently has a winning record in both league play (9-8) and overall (14-12), which is quite impressive when you consider the state of the program when he took over. I did a little googling, but could not find any recent proclamations by Dr. Dumas on the subject of UTC football. He is still at the school, but seems to be a bit more interested in politics right now, at least from what I could determine. It is probable he still feels the football program should be eliminated, but it’s hard to make your voice heard on such matters when people are loudly celebrating victories. Even though the Mocs lost a tough game last week at Appalachian State, you could make an argument that Chattanooga has been the most impressive SoCon team so far this season. After a 40-7 loss to Nebraska in which the Mocs did not embarrass themselves, UTC reeled off consecutive non-conference FCS wins over Jacksonville State (38-17) and Eastern Kentucky (23-14), the latter a road victory. Entering the game against Appy, Chattanooga had the most impressive early-season resume of any conference squad. Against the Mountaineers, UTC did not allow an offensive touchdown, but two defensive TDs by App State did in the Mocs. B.J. Coleman is in his third year as UTC’s starter after transferring from Tennessee, and is a major reason why the program is on the upswing. Coleman has 48 career TD passes (against 26 interceptions). I remember the game two years ago, when Coleman led a comeback victory over The Citadel by throwing 61 passes, somehow including no rushing attempts or sacks. Coleman’s primary target is Joel Bradford, who was first-team all-SoCon last season and is well on his way to repeating that honor. Bradford had 15 receptions for 162 yards in the win over Jacksonville State. 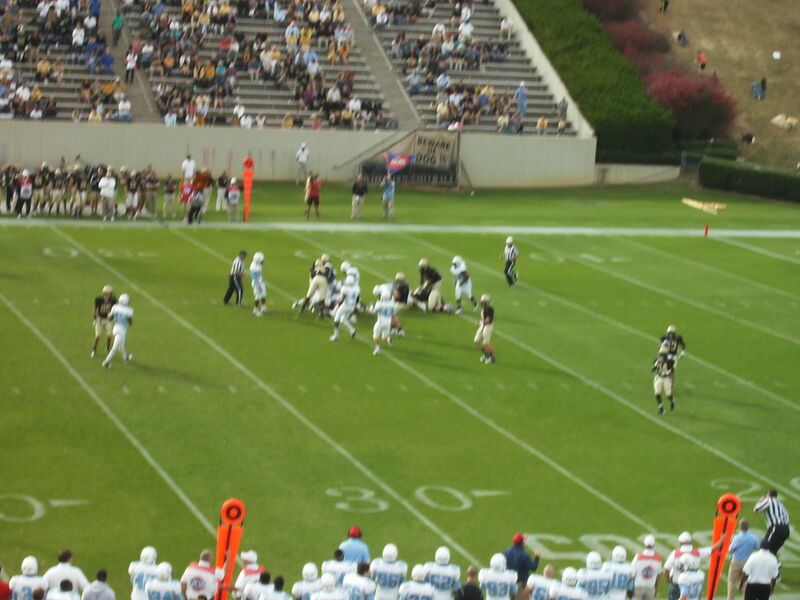 Chattanooga rushed for 212 yards against Jacksonville State, but only 32 yards at Appalachian State. Interestingly, Huesman seemed more upset with his receivers’ blocking than that of his offensive line versus Appy. On defense, UTC has been solid since the Nebraska game, particularly excelling on third down; its last three opponents as a group only converted 19% of the time in that situation. Redshirt sophomore middle linebacker Wes Dothard has been the SoCon defensive player of the week for two of the last three weeks. UTC’s strong linebacking corps also includes Ryan Consiglio, who had 13 tackles in the loss to Appalachian State, and all-name candidate Gunner Miller. The defensive backfield is excellent, and includes 2010 SoCon freshman of the year Kadeem Wise (who had seven interceptions last season) along with veterans Chris Lewis-Harris and Jordan Tippet. The Mocs will miss Nick Davison, as the defensive tackle is out for the season after an ACL injury. Punter Mike Hammons is a three-year starter, but placekicker Nick Pollard is a freshman who has yet to make a field goal of longer than 30 yards. 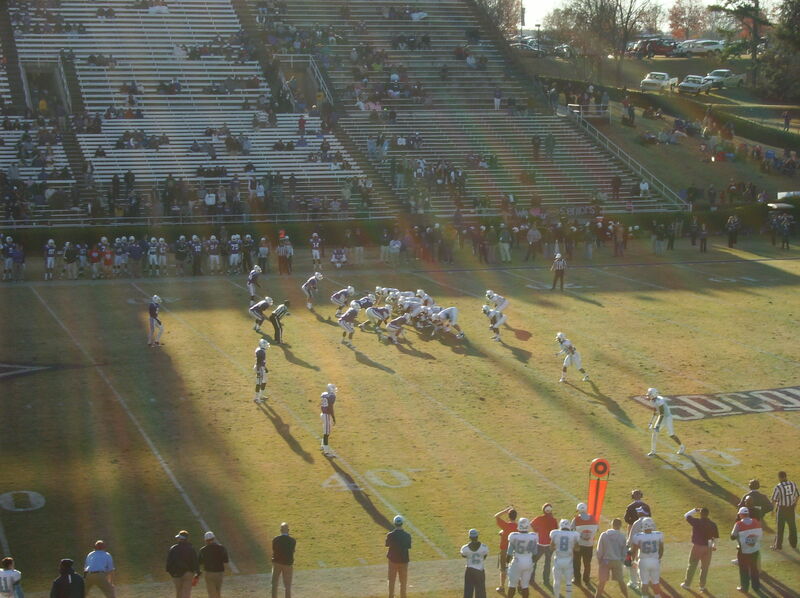 The Citadel’s defense has been really good so far, to state the obvious. I was really glad to see the excellent play in the red zone against Elon (after struggling in that department last season against the Phoenix), and the forced turnovers. It was an outstanding effort from the entire unit. In the last two years against Chattanooga, though, the D has A) let the quarterback throw the ball 61 times without being sacked, giving up a big lead in the process, and B) allowed 222 rushing yards in a game. I don’t expect either of those things to occur on Saturday, but UTC’s offense will again pose a stiff challenge. Obviously giving up around 30 points or so isn’t going to work for The Citadel, given the offensive issues. At his news conference Monday, Higgins reaffirmed his belief in starter Ben Dupree, while leaving open the possibility of using backup Matt Thompson or even true freshman Aaron Miller. 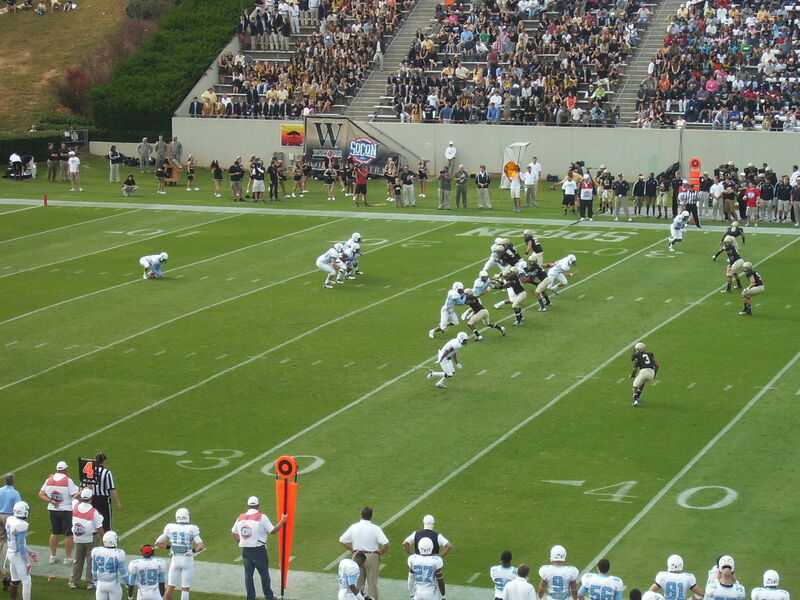 The Citadel had plenty of less-than-stellar passing days last season where Dupree wasn’t involved, like the aforementioned 2-8 (11 yards, plus an interception) against Wofford, or the 0-6 performance versus Appalachian State, or the “3 for us, 3 for them” outing in the Georgia Southern debacle (3 completions, 3 interceptions), or last year’s game against UTC (2-8 for 25 yards and a pick). I don’t think passing in and of itself would be enough to dislodge Dupree from the #1 QB spot. If he is having trouble making the reads in the Triple O’Higgins, that would obviously be a different story. I don’t think that’s what this is about, though. It’s really about the passing component of the triple option in general not working, whether because of passing, blocking, receiving, play-calling, or all of the above. Whatever it is, it’s clearly bigger than just one player. I’ll find out sometime on Sunday how the game went. I hope it’s worth the wait.